After a sunny dawn, which promised more than was delivered, NCC travelled north, to The Spiers and Hartwell Jubilee Stadium, the home of Evesham United Football Club. Here successive matches were scheduled, to settle the outcome of the Plate and Trophy competitions in the Cotswold Churches League. NCC, on first, was up against St Andrews, in the Plate Competition. In an impressive show the two teams were led from the changing rooms and onto the pitch, where the NCC squad shook hands with the opposition players, who were lined up with the match officials. The setting, in a stadium surrounding by low undulating hills, dotted with green fields and newly-leafed trees, formed an impressive backdrop. Under cloudy skies St Andrews started the game and were immediately on the attack. After four minutes the Blues gained a corner. Under the watchful eyes of the assistant-referee a high ball came over, which was pushed out towards the edge of the box. Here two attackers had another stab, and again the ball was partially saved, before a low effort was expertly cleared by Simon Cozens, with Aaron Brown still lying on the ground after his earlier parry. This was a close encounter which saw NCC saved by alert defending players; moments later the Reds’ keeper caught the ball towards the edge of his area, and sent it up-field. Now NCC mounted their first serious challenge of the match, and in greater numbers than their opposition had. A second visit saw Andrew Murton and Ian Jones cross the ball to Tom Mangan, who re-crossed it before a descending ball was successfully pouched by the keeper. On ten minutes a well-worked move again saw NCC attack in numbers, and pass the ball inside the box with great confidence. They gained a corner, but a high ball came down too far beyond the post for Ian Jones to work any magic with it. Now we had a few rapid solo runs from players of both sides; Simon Cozens saw his effort speed past the wrong side of the netting. A brief glimpse of the sun prompted some potent runs from each team, and St Andrews were awarded a free kick. A well struck volley whistled beyond both the outstretched arms of a desperate diving Aaron Brown, and the far post, for a corner. Although an excellent flighted ball, delivered into the midst of the massed players, was punched out by Aaron Brown, it still hovered inside the box before the danger was finally removed. A few moments later the same goalie dived on top of the ball, when, in a precarious movement, it had been pushed too far ahead by a solitary forward seeking fame. In the twenty-third minute NCC, in force, created an attack down their left, and a good pass found Andrew Murton. He ran through the defence before lifting the ball into the top of the net, to score the opening goal. NCC shaped a series of further attacks but the ball was either shot wide or saved by the keeper, once when he went beyond a post and prevented Peter Vaughan-Shaw from heading to the NCC forwards, and another time when he ran out to offset a solo run from Ian Jones. On thirty minutes Andrew Murton again sped towards the left hand post, pursued by a challenging defender, but managed to get his shot in; however the low-struck delivery was saved, somewhat fortuitously, by the opposition keeper, as he dived to his right. Then NCC gained a corner, as they continued to pile on the pressure. A high ball came to the keeper, who was clear in ample space, enabling him to take the catch with apparent ease. St Andrews came back into the game with several brief visits to the other end, before NCC had another corner, which saw a shot from Adam Cox taken by the keeper. Flowing football saw a further NCC corner, whence Adam Slade delivered another soaring ball. 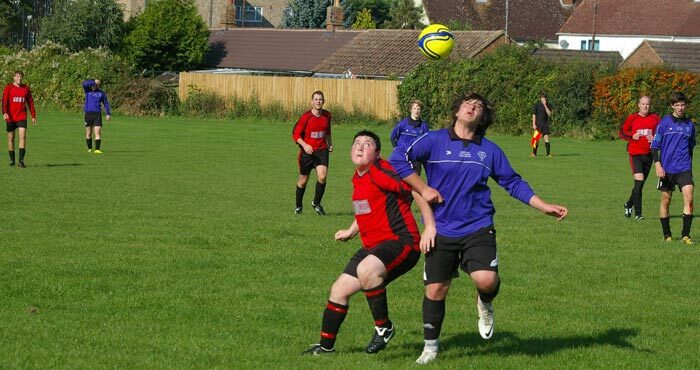 As the keeper and Tom Hardcastle rose the ball eluded both, and passed calmly into unmarked territory. Just before the half drew to a close NCC had one final effort when an Ian Jones shot was parried, and the ball ran across an empty goal before Simon Cozens was able to reach it. NCC began the second period, and at once was on the attack. First Ian Jones and Peter Vaughan-Shaw sped to the far end, without success, before Simon Cozens took the ball up the right wing, where his cross was gathered in front of Andrew Murton. Following one brief attack the Blues created another, on fifty-three minutes, which began near the half-way line. The ball was taken down, diagonally, before a volley was unleashed, from just outside the box. With surprising speed this flew over the head of Aaron Brown, and dipped just below the bar, almost grazing it en route to the back of the net. NCC was stunned, and St Andrews mounted a further sortie, gaining a free kick from the very edge of the area. Following several threatening moments the ball was eventually gathered by the NCC keeper. With a brief visit to the other end St Andrews gained a corner, but the rising ball was easily cleared. Much of the play rotated about the centre, with near misses at each end. The first was by Ian Jones, and then the opposition had an effort denied, as a well-taken corner was cleared by Andrew Murton. After a period of turgid play St Andrews sprang into life with several attacks. One movement, on seventy minutes, saw them come down their left and cross the ball. In a one-on-one situation a lone forward made no mistake, and lifted the ball into the right-hand corner of the net; St Andrews had taken the lead. Not downhearted NCC made further attacks. Although they wasted an early corner Ian Jones created another attack four minutes later. Thwarted, when the keeper stuck out a leg, the ball fell kindly to an alert Peter Vaughan-Shaw, who was able to thump it into the back of the net; all square again. Play flowed up and down the pitch, with NCC having three misses, when the ball was sent across an empty goal-area, and then hit wide, and over, the goal. Then, in the ninetieth minute, despite Aaron Brown’s sprawling effort, the ball went behind for a corner. Crossing at head-height the ball hit an attacker on the shoulder, and was deflected into the net. A minute later, in time added-on, the NCC players were up, trying to get that equalising goal. Denied, they saw St Andrews make a quick break downfield, where their initial shot was saved as the attacker volleyed over a sliding Matt Allison, but a second attacker, cleverly on hand, put the rebound into the far corner of the net, to consolidate their victory. NCC had the last two attacks, which saw the keeper take one ball head high, and another when he grabbed it as he rolled over. Full credit to St Andrews, who raised their game, especially in the second half, and so won a tense and good-natured final by taking their chances better than their opponents. On an overcast day NCC kicked off this important final league game, needing to triumph by five clear goals to win the title, and so deny last year’s champions another crown; a most daunting prospect. Cornerstone, unleashed like greyhounds from the traps, penned the opposition in their own half for the opening five minutes. Rushing down their left wing they let fly a loose shot, which Aaron Brown deflected past the post, for a corner. Eventually Simon Cozens headed the ball clear, and now it was the turn of NCC to advance. They dominated play for the next ten minutes, beginning with an effort which the keeper saved after a sprawling dive to his right. In this period Adam Slade was denied as he was closed down but NCC progressed with Tom Hardcastle, who saw his attempt just cross the bar. 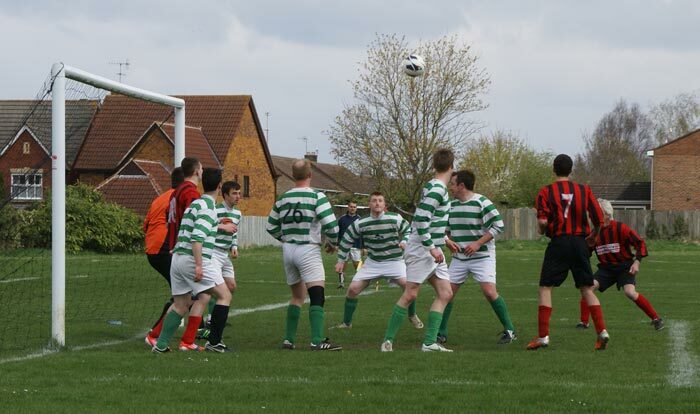 North Cheltenham had a free kick which fell nicely for the home keeper as the visitors were arriving. Breaking out the champions made a rapid run down their favourite left and sent a shot across an empty goal. After NCC had seen off another attack, with Aaron Brown gathering the ball beyond a post, play took on a different style as we witnessed a series of end-to-end efforts. 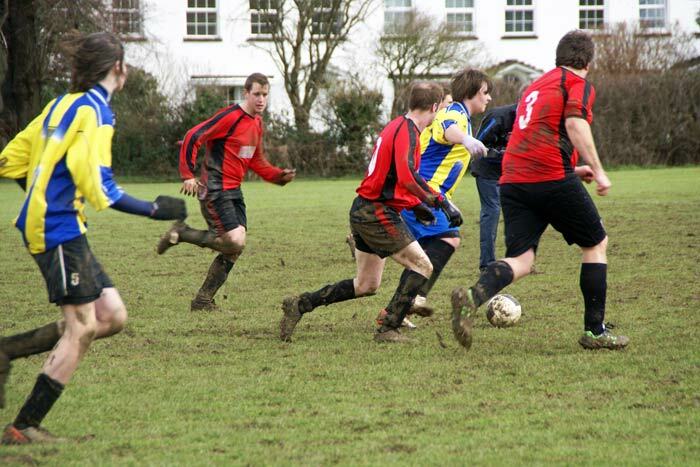 During this period the Hoop’s best endeavours came from Tom Hardcastle and Ian Jones; the latter being denied with the keeper marooned away to his left. Cornerstone, commanding the bottom corner, created a series of chances, one with the NCC keeper stranded, but the ball was sent behind for a corner, and another effort was cleared by Andy Macauly. In fact they came closest to scoring before Aaron Brown eventually pouched the ball. Then, on twenty-eight minutes, play was suspended after a Cornerstone player, attempting a header, fell awkwardly on his knee, and lay in agony. There was a twelve minute delay before play could recommence during which time the medics arrived, assessed the situation and called for an ambulance. NCC began the forced restart with some promising attacks but clever defending denied them. In turn Cornerstone created another great scoring opportunity but NCC was defending in depth. The hosts quickly won successive corners and then Adam Cox denied a lone attacker. As the half drew to a close the challengers were creating a series of chances through the endeavours of Adam Slade and Emlyn John to supply the team’s strikers. As the dramatic half ended the break would give both teams an opportunity to assess ways of gaining that all important opening goal. The new half began with alternate forays from the two evenly balanced outfits, although Cornerstone spent more time attacking than defending; once their keeper came to the edge of his area to deny Ian Jones. Tom Mangan tried to create a great scoring opportunity but was denied by the well-positioned defenders. Cornerstone, having the better of the play, was denied by NCC, who defended in depth and was indebted to their keeper; one such effort saw Aaron Brown make a great diving save as he pushed the ball behind for a corner. Then, just before the hour mark, and following an NCC attack, Cornerstone broke quickly and a lone player sped up the right and tore through the visitors’ defence. Although his initial shot hit the right-hand post he controlled the fortunate rebound and sped across the goalmouth before slotting the ball home. Then the champions moved up a gear and came close to netting a second when an over-hit back pass was prevented from entering the goal as Aaron Brown instinctively punched the ball away. The hard-working NCC came close twice in quick succession, both from diagonal crosses which were directed towards the far post. Unfortunately these eluded everyone, defenders, keeper and, for NCC, first Andy Hill and then Peter Vaughan-Shaw. Approaching half an hour of the second half play was again held up, to allow the ambulance to enter the field and take the injured player to hospital. After sixteen minutes the teams endeavoured to pick up their threads, as the game was once more restarted. With less than twenty minutes remaining NCC went on the attack. One sweet movement saw the players spread across the field as they advanced and another saw the keeper take a descending ball before Andrew Murton or Adam Slade were able to reach it. Then Nicky Jordan, once of Cheltenham Town and now a substitute, nearly scored but his outstretched right leg could only send the ball over the bar. With less than ten minutes remaining Lewis Hough replaced Adam Slade, the latter given a sporting pat on his back as he left the field. Lewis Hough was soon in action, as his header tidied up a Cornerstone set piece. When NCC progressed they found Cornerstone was defending in depth, at times nine players blocked their progress. At the very end of the game Aaron Brown made a tremendous save as he denied a lone predator the chance of further success. A draw would have been a fairer reflection of play; sadly this was the fourth time this season that NCC had lost a league game by just a single goal. As the victors were Cambray and Cornerstone each time this shows how well the team has progressed this season in achieving their highest ever league position as runners-up. As a tribute to the team’s performance this season the NCC was named Team of the Match. Congratulations to all concerned, including our linesmen, today Declan Shiels took the honours; enjoy the reward and dream only of the new season! At 6.30 on an overcast evening, and in front of a well above-average number of spectators, NCC kicked off this plate semi-final match against Cornerstone Rangers, another of the teams fielded by Cornerstone. In the opening minutes the visitors wasted a free kick, and shot wide, before a lone Ranger, their speedy number seven, made two forays down his right. The first was well denied by Aaron Brown, coming out to meet him, and from the second the Rangers gained a corner. In between Simon Cozens replied with a couple of quick sprints up the left wing, the first saw him denied by the Rangers’ defence but the second created a great scoring opportunity when he sent over a low cross. Unfortunately the ball was missed by both Ian Jones and Declan Walker, the latter attempting to slide the ball in. Moments later it was déjà vu as the ball was again crossed by the home forwards, but fell to the visiting defence. This pulsating game had now reached its mid-point in the first half. The visitors took a well-directed free kick, which saw a high ball appear to be suspended for an eternity, within the gathering gloom, before eventually descending beyond a couple of foraging forwards. In turn NCC had a free kick, at the edge of the box, which forced the visiting keeper to make a good save near his right-hand post, as he reached up whilst balancing on his left leg. After defending a corner NCC came up in strength, but through-balls evaded the efforts of Simon Cozens and Andy Hill. Moments later the Rangers’ keeper made another fine save, again pirouetting on his left leg, but this time near the opposite post. At the other end Aaron Brown produced another high-quality save just before this opening half ended. Although NCC had created more scoring opportunities the Cornerstone Rangers demonstrated their equal participation with a series of flowing attacks which saw the scoreless game delicately poised. The Rangers keeper pulls off another great save, whilst balancing on his left leg! Following a brief half-time the visitors restarted the game, and were immediately on the attack, before it was their turn to defend. NCC survived two successive corners; the second coming after Andy Murton had headed the ball behind. After fifty-three minutes NCC forced a prolonged attack deep inside the opposition area. A good ball from Tom Hardcastle found Ian Jones, out on the left wing. He ran through the opposition defence, and as the keeper came out so he lifted the ball over his head, to watch with delight as it flew into the empty net. Both teams attacked with equal frequency; NCC saw the ball cross the opposition goal-mouth with no one on hand and the Rangers saw Aaron Brown make a reflex save as he pushed the ball away, only to see it hit a post and go behind for a corner. Then NCC spent seven magnificent minutes deep inside the opposition half. Andy Hill sent in a powerful header which the keeper managed to push out before the ball was sent behind the visitors’ goal. A minute later the visiting keeper made two brilliant reflex saves in rapid succession, the second saw him knock the ball up and then coolly collect it on the way down. As the mid-point of the second half was reached NCC was playing some wonderful football and moving the ball around with great skill. Each side made a strong attack, with both Ian Jones and Peter Vaughan-Shaw having chances. This was followed by NCC defending a well-taken corner, which saw a high ball descend parallel to the bar, before it was dealt with by last man Adam Cox. With ten minutes remaining Ian Jones, out on the left, was unable to pierce the defence of two defenders and the keeper coming out. Shortly after this play switched to the top end of the field where a high ball was met by a Ranger as he jumped. His powerful header looped over all, to finish in the back of the net, and beyond the prone body of the home keeper; one goal each. Seven minutes remaining, and everything still to play for. After further attacks from the Rangers it was NCC who was on the move, as their players charged down the left wing in numbers. Ian Jones managed a shot on target, which sped beyond the prone keeper, but to his horror a sprawling defender skilfully prevented the ball from finishing its course, and sent it out for a throw-on. All was not lost as Andy Hill gained the ball, and the man of the match award, as his shot drilled the net, with less than three minutes remaining. NCC weathered a final attack and saw the team come close as Ian Jones was denied again, but they ran out worthy winners for a place in the final of the plate competition. After weeks of the nation suffering from the cold easterly wind the day of the match dawned sunny and pleasant, as NCC hosted St Andrews, in their final home league game of the season. It was a delight to see Chris Dagnall, the team’s sponsor, of Revolve Photographic Studios, watching the game, and what a good show was laid on for him. As the visitors started the game they did not know the immediate surprise awaiting them. From the kick-off Andrew Murton nipped up to their end and, following a fumble by the keeper, gained the ball and coolly dispatched it into the back of the net. What a sensational start, and only fourteen seconds on the referee’s watch. It was obvious that the visitors were unprepared for the start of the game, for a couple of minutes later their keeper, wearing a black top, was requested to change this. Andrew Murton came sweeping up the left wing, only to see the keeper coming out to meet him. Calmly he stroked the ball beyond the advancing keeper, but could only watch in dismay as it sped by the far post. St Andrews, sporting their light-blue tops, came storming down in attack, but the home defence held firm, although they conceded a corner. Initially headed clear by Mark Broekman it was Andrew Murton who initiated another foray up-field, where Emiliano Cipriani and Ian Jones, although outnumbered, persisted against their opposition, and won a corner. The visitors continued with kick and chase, but it would require fitter, faster and more skilful players to gain any advantage against the solid NCC defence. In the eleventh minute NCC sped up their left, gained a throw-on and then crossed the ball. Waiting in space was Ian Jones, who jumped like a gazelle, to head a hard drive over the nearest defender, and beyond the reach of the keeper. As Ian descended so did the ball, but into the back of the net. For the next few minutes play alternated up and down the field, and both keepers made straightforward saves. Slowly NCC developed their advantage, making more frequent attacks and more penetrating forays, ably generated by Adam Cox, doing a splendid job in defence. From one such attack, in the twenty-first minute, Ian Jones advanced up the right wing, whence he crossed the ball to Mark Broekman, who struck a low shot into the net, to put the hosts three up. NCC in general, and Emiliano Cipriani in particular, were unlucky when an apparent goal was disallowed; it was judged that the keeper had been fouled. Shortly after this Ian Jones too was unlucky as he took the ball up-field, and pushed it towards goal, past the keeper desperately rushing out, only to see his gentle tap knocked clear by a defender speeding to the rescue. Just past the half-hour St Andrews came down both the right wing and mid-field, in strength, and won a corner. Sent behind they gained another corner, and this time the visitors saw the ball volleyed into the net with a fierce drive. Spurred on the visitors moved up a gear, and created their best period of play. NCC came up their left wing, and seeing that the St Andrews keeper had come out sent a shot towards goal, but it passed beyond the far post. Minutes later the visiting keeper jumped to knock down the ball, almost from off the head of Ian Jones, and then pouched it successfully. Just before the break Ian Jones saw another of his solitary efforts denied as the brave keeper parried the ball from in front of him. The hosts were controlling ball possession, and so dominant were they in these final minutes that the opposition made only an occasional visit to the far end. It was a more purposeful NCC which started the second half with an attack down the slight slope. This greater resolution paid off within three minutes when Adam Slade opened his account as he sent the ball into the net. A minute later NCC was given a free kick, from inside the opposition half. A well-struck dipping shot was beautifully taken by the keeper, as he jumped with arms fully stretched, to grasp the ball before it plunged under the bar. Ian Jones made one of his solo swerving runs through the middle, hotly pursued by two defenders and also confronted by an advancing keeper. Against such odds the inevitable result saw both Ian and the keeper stretched out on the turf and the ball sent up-field. Ten minutes into the second half St Andrews changed their keeper, a result which enabled them to pack a greater punch into their attack, although only an analyst would notice this. Statistics might show a fairly even distribution of attacks created by each team, but it would need another set to discriminate between the power and danger each side threatened, here NCC was vastly superior. St Andrews had one prolonged attack which saw them spend a couple of minutes moving the ball around, losing it and then regaining it, before the danger was cleared. Just past the hour mark Adam Slade received a cross and volleyed the ball into the top of the net, 5-1; NCC in total control. Play alternated between both ends, as demonstrated when the NCC, having cleared a corner then created a great chance at the bottom end before the visitors gained a free kick. Taken on the right this opportunity was sent across the field where a high ball was propelled towards the NCC goal, but this descended wide of the post, and into safety. Moments later St Andrews had a better chance, which saw the ball cross the goal line just a yard beyond the same post. Following a foul on Ian Jones the hosts were awarded a free kick, some five yards from the half-way line. Propelled with perfect speed and direction the ball sped by the keeper, and bulged the net. St Andrews had been hit for six, and man of the match Adam Slade had completed a twenty-five minute hat trick. Within four minutes a sweet move saw Ian Jones and Mark Broekman denied but the ball fell to Andrew Murton, who sent a drive between the keeper and the post, for yet another goal. Two minutes later Adam Slade sent a volley just over the bar, missing an absolute sitter, and then he hit the post, what a day! This was followed by a rare attack from the opposition, but it lacked numbers and was cleared by Declan Shiels. NCC continued to attack, with half-chances falling to several players, and at the other end Aaron Brown was fortunate as he lay on his stomach, helpless, and watched the ball roll beyond his far post. Mark Broekman, positioned on the edge of the goal area, received a cross and completed the scoring when he ran towards the goal line before sending the ball into the net, from the narrowest of angles. The keeper, standing by his post, completely misread the situation, and had to retrieve the ball from the back of the net. There was time for one last attack from St Andrews before the final whistle was blown; leaving NCC worthy visitors, and by their greatest-ever margin in the league. After early morning rain NCC played their long-awaited plate game against C3 Dons; a case of third time lucky after the previous games had been postponed because of bad weather. 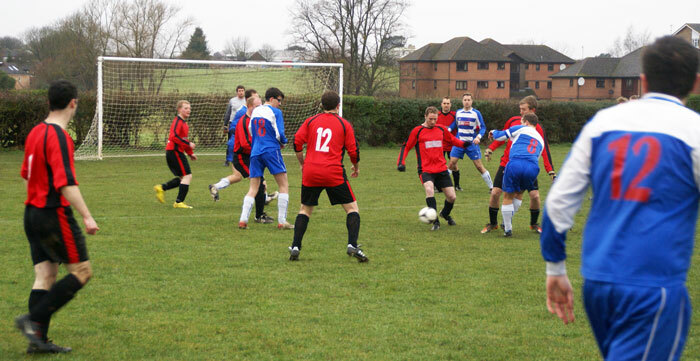 Both teams started well, and in the opening five minutes had alternating attacks which were all cleared. The home keeper, Joseph Cowley, had first touch of the ball, and his team created the most threatening attack of this brief period. This resulted in great defensive work from Matt Allison, before the Dons fired wide. Then, after seven minutes, Adam Slade had a run up the left wing, from which NCC gained a corner. Here a high ball was headed out, but only as far as Andrew Murton, who volleyed a return. His effort saw the ball diverted into the net by Ian Jones, positioned some ten yards from the goal, for NCC to open their account. As play continued to flow up and down Andrew Murton had a shot well saved by the keeper, down on one knee, with his body behind the ball. Emiliano Cipriani was closed down in front of goal, and Adam Slade created a chance, following another smart run up the left. On twelve minutes Ian Jones, who had gained the ball from the home defence, sent in a high powerful shot, which sped through the narrow gap between the keeper and his right-hand post, and so doubled the score. For the next ten minutes NCC created waves of attacks in their efforts to score more goals; all were denied largely to some stupendous keeping from young Joseph Cowley. His exhibition included dives to both right and left, a stab from Adam Slade stopped with his finger tips, a run-out to the edge of his area resulting in a jump to grab the ball, another attempt was saved by his legs and Lady Luck smiled on him when an NCC effort grazed the bar. However, NCC’s constant pressure paid off as two further goals were scored inside two minutes. The first came from the boot of Adam Slade, an attempt which the home defence might have dealt with better. Then, on twenty-six minutes, and after a trio of tantalisingly close efforts from NCC, Ian Jones completed his twenty-minute hat-trick with a stunning hard-hit left-footed shot from close range which gave the hapless keeper absolutely no chance. Within minutes the home keeper had pulled off three more excellent saves, one as he jumped with outstretched arms to guide a high shot behind, for a corner. We saw Matt Allison denied in front of goal as this intrepid keeper leapt yet again to pouch the ball. Although NCC had most possession and play there were occasions when the Dons came at them, and one such effort saw the ball speed past their empty net. This was followed by another opportunity lost by the Dons, when the ball was crossed level with the bar, and just in front of it. Surviving unscathed NCC pressed on in their quest, doubtless with memories of the hard-fought encounter, and scare, posed by their last meeting. Adam Slade continued to cause problems as he came up the left. Then Andrew Murton side-stepped the keeper and sent over a beautiful effort, which crossed the empty goal, watched by both helpless defenders and attackers alike. After another Dons’ attack Andrew Murton took the ball up-field. As he approached the edge of the muddy box so he unleashed a low drive, which ended up in the back of the net. Two minutes later another NCC attack saw the ball pushed out by the keeper, as he made a great parry. Unfortunately for him the ball fell kindly for Adam Slade, who delivered a fluent pass between the recovering keeper and his post; just reward for Adam’s hard work, and the Dons had now conceded six. The Dons missed a great chance to score when NCC’s defence had come up too far. Despite this the hosts spent a few minutes deep in the opposition territory, before their attempt sped beyond the far post. In the closing minutes of the opening half NCC saw yet another of their challenges denied when a dipping volley was held by the keeper, jumping up with arms outstretched, and taking the ball just below the bar. 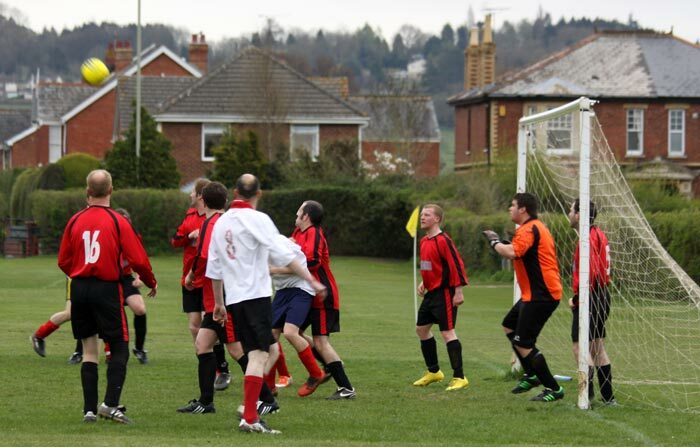 As the half ended Joseph Cowley was still being kept busy, as NCC continued their relentless pressure. For the second half NCC changed their goal keeper, Matt Allison taking over from Aaron Brown. He was soon in action as the home side created the opening opportunity, followed by a second chance shortly after. NCC gained a corner, and followed this up with a great effort from both Adam Slade and Ian Jones; each was denied by the defenders, the keeper and the contrariness of the muddy ball. Man of the match Lewis Hough initiated a solo run which ended with his diagonal attempt passing beyond the far post as other players arrived. NCC was creating several attacks, but these came to naught as their efforts were cut-out, or saved by the proficient keeper. The home side had a rare attack which saw them threaten for a few minutes. Then, as the sun came out and warmed the backs of the NCC, they sped through the mire, and won a corner on their right. 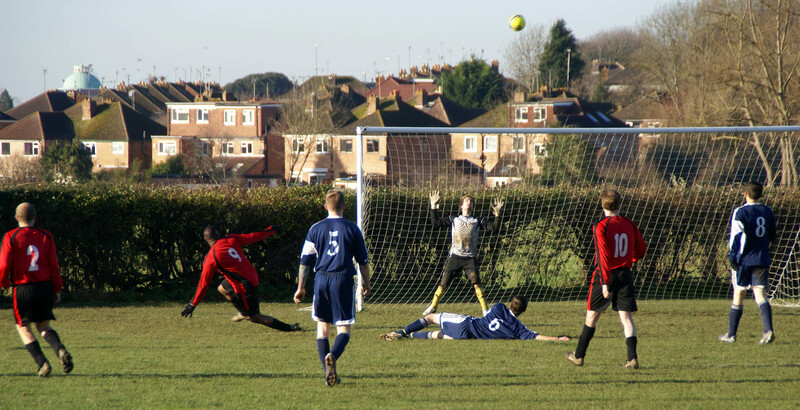 A high ball, sent goal-wards by Tom Hardcastle, was pushed out by the keeper. Falling nicely for Tom he had a second try, and threaded a pulsating drive between the keeper and the defender on the post. In the fifty-seventh minute number seven had scored number seven! Despite the score the Dons continued to attack, but rarely in numbers, and so they were easily denied. Around the hour mark they created a succession of forays, but they all became bogged down. At the other end NCC seemed adept at piercing the Dons’ defence, although frequently the result was not that for which they were hoping. Then, on sixty-seven minutes, Lewis Hough dribbled down the left wing and delivered a perfect cross towards Tom Hardcastle, waiting near the penalty spot. His shattering shot sped like a rocket into the far corner of the net, leaving the home players motionless. Within minutes Joseph Cowley had pulled off two more well-taken saves, with Matt Allison making a catch of his own at the other end. 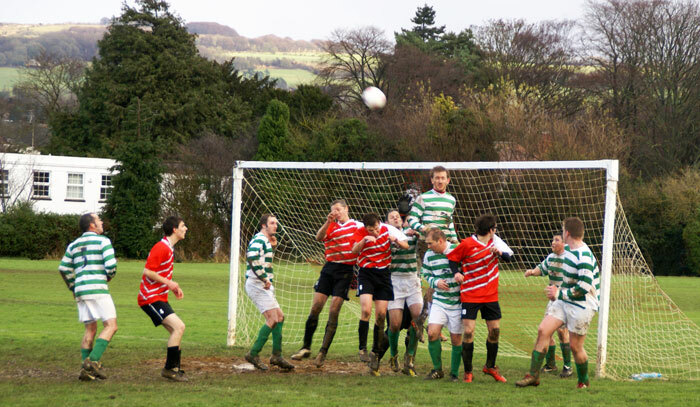 NCC won another corner, and as the high ball began to descend over the penalty spot four players, two from each side, made an attempt to reach the ball. Ian Jones out-jumped the rest but young Joseph was there first, and pushed the ball away, into comparative safety. Although NCC continued to create many more chances, these went wide or were pouched by the keeper. Andrew Murton had shot come back from the right-hand post but there was nobody nearby to tap in the rebound. In the last fifteen minutes NCC scored three more goals; the first when Ian Jones rifled an effort into the top of the net. Within two minutes NCC’s number ten, Andrew Murton, moved out to his left, and advanced towards goal. As a defender neared so Andrew calmly lifted a delicate ball, and caressed it so sweetly through the narrow gap between the keeper and the post, such precision! This, his second, saw the NCC tally total ten, the first time they had reached double figures. The visitors continued to win corners, and took one, from the left. 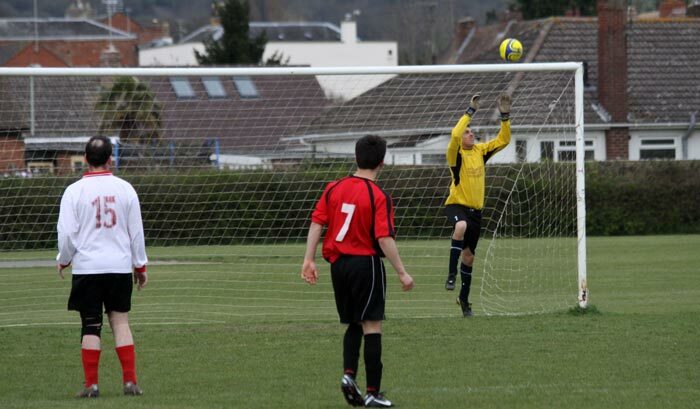 As the ball came over so Simon Trew was on hand to complete the scoring with a powerful header sent high into the net. 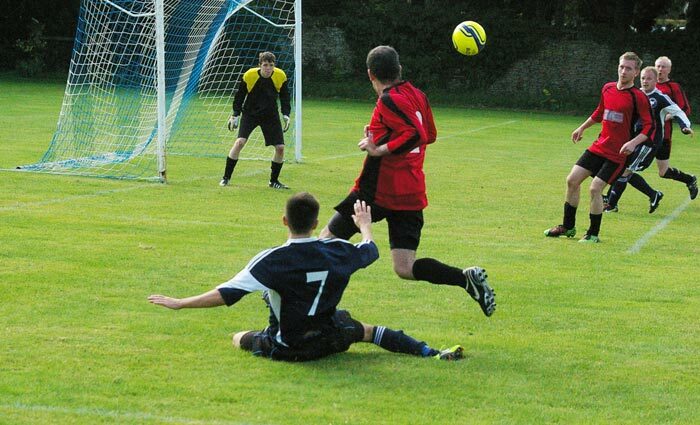 As the minutes ticked away NCC had another corner; from this Tom Hardcastle saw his shot just cross the bar. There was time for the Dons to have one more try, and NCC completed the game when their final effort failed. This is the highest-ever score by NCC, in any match whatsoever. NCC bounced back from last week’s narrow defeat to title rivals Cambray with a hard fought win over in-form team Cheltenham Trinity, who came into the game having won their last three matches and conceded only one goal. Both teams played a passing game on a pitch that lent itself to a more composed style and the hosts might have taken the lead on five minutes. A superb run and cross from Jon Whitlock was cleared for a corner from which Simon Trew headed powerfully and narrowly wide. The visitors looked just as lively in attack, and minutes later Simon Trew was penalised for handball on the very edge of the box; Aaron Brown tipped the resulting free-kick over. Trinity did take the lead, however, three minutes later, when a superb exchange of passes opened up the home defence and Trinity’s Dan Johnston calmly side-footed home. NCC was on the back foot with the visitors creating further chances and looking likely to extend their lead. However a slide rule pass from Tom Mangan released Andy Murton, who drew NCC level with a sublime finish, curling the ball past the Trinity keeper with the outside of his boot. Peter Vaughan-Shaw rattled the bar on twenty minutes and an entertaining passage of play followed, with both teams playing an expansive game. Another superb finish from Andy Murton put NCC ahead on the half-hour, the striker firing into the top corner from outside the box. A third goal followed five minutes before half-time. Peter Vaughan-Shaw’s well struck shot was going wide until Jon Whitlock skilfully diverted it back into the box, where the predator Ian Jones was on hand to smash it into the roof of the net. This was the three-hundredth goal NCC has scored, in all competitions! Tom Mangan might have added another one on the stroke of half-time, firing just over when the ball fell to him in the box. The beginning of the second half struggled to match the fluency of the first, play became rather scrappy, and Trinity was unfortunate not to reduce the deficit on the hour when a melee in the area led to several shots being blocked by a combination of heroic defending and good luck! Full-backs Dan Higgins and Declan Shiels made some vital tackles and were backed up by a superb display from centre-halves Simon Trew and Adam Slade. The latter looked in imperious form, but NCC needed another goal to make the game safe. It came on sixty-three minutes when the indefatigable Peter Vaughan-Shaw raced down the left and pulled the ball back perfectly for Jon Whitlock to slam the ball past the Trinity keeper. This was the first goal Jon has scored for the club, well done Jon! Three minutes later Adam Cox showed all his finesse with an incisive pass that sent Ian Jones clear, and the striker’s pace and power did the rest; an emphatic finish giving the goalkeeper no chance. Tom Mangan, who had shown superb composure at the heart of midfield, took a heavy knock and had to be replaced by Matt Allison, but the points were in the bag. Trinity scored late on when a fantastic cross from Rob Barrow set up his brother Harvey at the far post but the goal was no more than a consolation, although Trinity can count themselves unlucky to have come up against NCC in such clinical form and the visitors fully deserved another goal. The Man of the Match award was given to Andy Murton whose two superb strikes turned the game on its head, but Adam Slade deserves a special mention for a composed and commanding game at the heart of defence. On a bitterly cold morning, punctuated by a series of solitary snowflakes dropping in, NCC, the current league leaders, kicked off against second place Cambray. It was the Reds who made the initial running, with the Cambray keeper having first touch of the ball. The game developed into a fast and furious match, which saw play flow rapidly up and down the pitch, but one in which the keepers were kept fairly quiet, for the moment. Cambray wasted a free kick, awarded just outside the box, and shortly after were denied when a lone forward was closed down by the home defence. Just past the fifteen minute mark Ian Jones had a good opportunity to score near the right-hand post, but miscued the ball. At the other end Cambray created a chance with a header, but this was easily saved by Aaron Brown. Then, on eighteen minutes, NCC launched two attacks in quick succession, the second saw a high ball delivered towards the far side of the goal and away from the keeper. 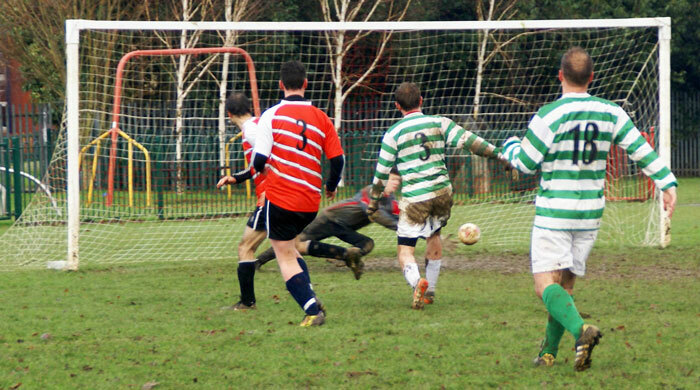 As the ball descended so Ian Jones nipped in, and nodded it beyond the reach of the keeper, to open the scoring. This was followed by Adam Slade sending a good ball down the field, towards Andy Hill; the latter was unable to turn and fire before he was closed down. NCC spent some minutes deep inside the Cambray half, but their skilful defenders resolutely, and consistently, denied the hosts. NCC was awarded a free-kick on the far corner of the box. Emlyn John sent in a well-directed grubber, but the keeper had it covered the whole way, and was able to save with apparent ease, although he did smother the ball with his body. Just before the half-hour Cambray was awarded another free kick, from almost the identical spot of their earlier effort. Although crossed the ball was put behind, for a Cambray corner, which was re-crossed, before the danger passed. Not for long, as play went up the left wing, and a high ball was delivered into the goal-area. Aaron Brown went out, and, as he balanced precariously on his left leg, he got a glove to the ball, and was able to fend it away. Not far, as he retreated so the ball was returned, and, despite getting another hand to it, the corner of the net bulged, to ensure Cambray gained parity. Andrew Murton (5), man of the match, has taken a free kick straight towards goal. Cambray gained another free kick, followed by a wasted chance and corner. Then the remaining ten minutes of the opening half saw NCC produce some impressive football. It began with the award of a free kick, taken by man of the match Andrew Murton. A beautiful dipping volley was struck, which sped towards the very centre of the net, only to be knocked away by a deft header met by a jumping defender, the only player who appeared to move. This was followed by a corner, cleared, with the keeper prone in the angle of his goal. As the ball came out so Emlyn John returned it to the side opposite the keeper. Reflective of Cambray’s skilful reading of almost every situation it was galling to see the ball blocked by one of two defenders. It did not go far before Adam Cox attempted to turn it, although he was facing the other way. From this NCC gained another corner, which crossed the goal, and continued behind, to give all a short-lived breathing space. Undaunted Cambray went on the attack, and only some plucky keeping from Aaron Brown saved the day. Minutes later the half-time whistle ended what was a brilliant spectacle of football from two well-balanced teams. What would happen in the next half? 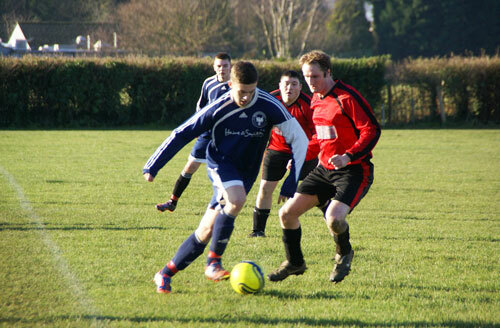 Cambray restarted the second half in an ebullient mood, and came at NCC from the onset. The hosts were pegged back, and conceded a free-kick, followed by a corner. Although their defence was hard-pressed it was holding, at least until the fifty-second minute. Then an attacker sped down the right wing and entered the six-yard box. As the home defenders rushed back, and Aaron Brown came out there was a misunderstanding between them, allowing the ball to be posted beyond the keeper, and into the empty net, to give the visitors a lucky but vital lead. NCC saw the ball pass just wide of the other goal, and then Ian Jones was denied as he made a solo run into the box. There he failed to reach a diagonal pass as NCC, matching their first-half efforts, won a corner. With seven defenders strung across the goal mouth numbers told, and the danger was averted. Moments later another NCC shot sped past the left-hand post. The hosts still penned Cambray in their own half as they won a corner, which saw the effort easily gathered by the Cambray keeper as several Red forwards charged towards him. A Cambray break saw a shot parried by Aaron Brown, and the visitors hung around before NCC was able to mount another attack themselves, winning a corner. As the ball came over so Adam Slade made a valiant effort to head home but was denied by the intervention of the keeper. A quick break saw Aaron Brown make a save and then volley the ball up-field, where Ian Jones was closed down in identical fashion to that of ten minutes earlier. Andy Hill saw his turn-and-shoot effort sent into the arms of the diving keeper. Then Andy Macauly, coming up the left, sent the ball to Andy Hill, whose drive was stopped, but the ball bobbled around inside the area before it was cleared. Aaron Brown made a great clearance as he sped to the edge of his area to intercept a fleet forward who had broken through the NCC defensive line. At the top end Ian Jones was denied yet again, and the loose ball eventually fell to Adam Slade, whose effort was stopped by the legs of the keeper. Almost immediately Andy Hill was most unfortunate as his headed attempt rebounded from the top of the bar. 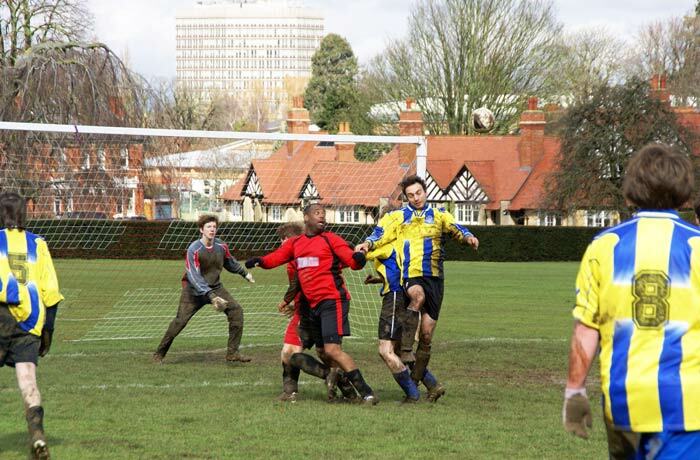 Cambray gained a free-kick, taken judiciously, before NCC attempted their final stab, winning a corner. In a tightly packed area the Cambray keeper remained calm, and saved their day. From just inside the opposition half Emlyn John took a free-kick, but this ended well wide of the target, although Cambray conceded a corner. This was punched out, enabling Cambray to relieve some pressure, and gain some time, as they created a series of forays down field. It was enough to ensure they came out as the winners of a thrilling contest, a game which saw them end NCC’s record-equalling sequence of six matches undefeated; and guess which side inflicted the last defeat on NCC? On a murky morning NCC kicked off this local derby. Immediately St Matthews came down the slight slope, and spent a couple of minutes pinning NCC deep in their own half. In turn NCC went up, but their diagonal pass eluded all. For the remainder of the opening quarter the play flowed up and down a tacky field, but St Matts created more threatening positions; however all were successfully cleaned-up by the NCC defence. One such clearance, a long boot from Aaron Brown, sailed up-field, bounced over the home keeper, and headed goalwards before the fortunate keeper was able to grab the ball in time. During this period the game was interrupted for a couple of minutes by a stray dog; his four-pawed drive and great turn of speed would have been appreciated by both sides! The hosts won a couple of corners, from one Aaron Brown made a great save as he pushed the ball behind. At the other end Ian Jones was unable to capitalise on a great opportunity when positioned on the edge of the six-yard box. St Matthews had a long-range diagonal shot put behind, but the resulting corner was wasted, as NCC gained a free kick. 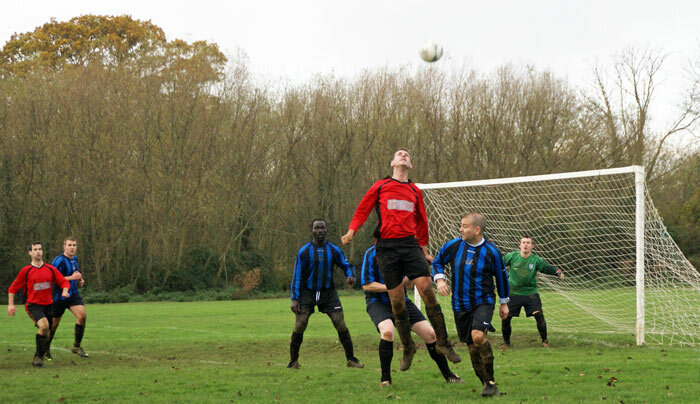 Peter Vaughan-Shaw gained another free-kick, on the edge of the opposition box, and this put NCC in a good position. The cross, and its return, hung about before the danger was cleared. Approaching the half hour St Matts were attacking in the bottom left hand corner. The ball, intercepted by NCC, was only partially cleared, and sped out to the right. Here an attacker, facing the wrong way, and being threatened by defenders, cleverly back-heeled the ball. Caught out, the NCC defence was powerless to prevent an unmarked forward from sliding the ball into an unguarded part of the net, to open the scoring. 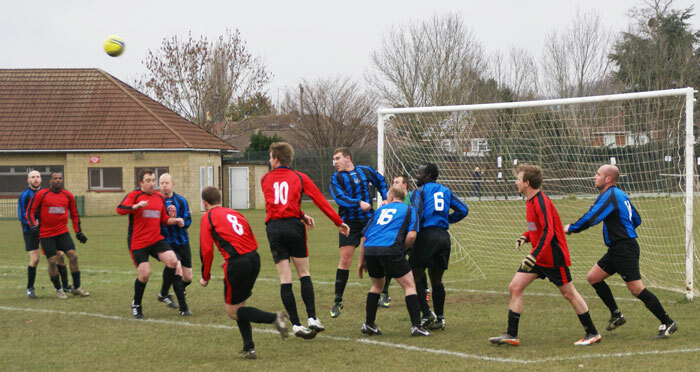 Almost immediately NCC mounted further attacks, as they attempted an equaliser. This all-important goal came within five minutes, as NCC had a throw-on, in the top left corner. The ball came towards Simon Trew, just positioned inside the area. His great jump saw the ball flicked goalwards. As Simon landed, still facing the other way, he was unable to see the descending ball squeeze through the narrow gap between the keeper and his post. A deserved goal, and a vital one in the context of the game. In the closing stages of the first half the Saints had two free kicks; both went for corners which were easily cleared by the NCC defence. Then Simon Trew had a dipping header fall nicely this time into the waiting hands of Pete Aldred, and Peter Vaughan-Shaw saw his dynamic run stopped as he was up-ended. through the narrow gap left between the keeper and his post for NCC to level the score. Andy Hill, on the very far left, Ian Jones (11) and Peter Vaughan-Shaw (6) watch. It was two quite different teams who emerged after the break; the Saints had dropped down a gear but NCC had moved up into overdrive. In the opening minutes the hosts made two brief but fruitless sorties into the NCC half. Ian Jones was denied as he chased a good through ball, and a further effort was sent wide. St Matthews spent some anxious minutes in the NCC half, winning a well-taken corner and causing Aaron Brown to make at least three saves. Just before the hour mark Ian Jones, coming down the right, had his shot blocked by a defender and the keeper; both had come out. The loose ball fell to Peter Vaughan-Shaw, who, from a tight-angle, sent it over the heads of all and on into the empty net, for NCC to take the lead. Resolute defending kept out the Saints, before NCC charged down the slope again. Their initial foray saw the ball blocked by the keeper, but then Ian Jones lead an attack down the right. He pushed the ball to his left, towards Adam Slade, who had his back to the goal. With the deftness of a twirling ballet-dancer Adam pirouetted and neatly prodded the ball past the falling keeper, who could only watch it roll away from him, and into the net, as he lay prone. A brace of goals in five minutes. Two minutes later a well-struck long range shot, from Simon Trew, was skilfully pushed over the bar by Pete Aldred. Ian Jones created a series of scoring chances, including one from a free-kick, and Andy Hill had an attempt go wide, as NCC was demonstrating their superiority. After a couple of minutes Andy Hill had another effort sent wide as he tried to turn by the far post. A well-worked NCC move saw the ball crossed from the right, and then re-crossed, before it was eventually taken by the keeper. As NCC came down again their forwards sped through the empty home defence with comparative ease. Ian Jones passed the ball to Andy Hill, totally unmarked. Although defenders were rushing towards him he had time, skill and composure to select his spot, and send a low diagonal drive into the far corner of the net, piercing both keeper and defenders, and ensuring a win with another ten minutes left. Further attacks saw strikes from Emlyn John and Adam Slade go wide, before St Matthews attempted to trouble the inactive defence at the other end. As NCC piled on the pressure they had a strike cross an empty net and Ian Jones wreaked havoc as he sent one effort straight into the arms of the keeper and had another blocked by him, before it was sent out a for a corner. The Saints were fortunate from this corner, as the high ball passed over the head of the beaten keeper before landing on the roof of the net. With two minutes left Adam Slade sent a long low shot past the outstretched arms of the keeper, for NCC’s fifth and final goal. This ensured only their second league victory against St Matthews, and by their greatest margin. Declan Walker was named man of the match, but the whole team deserved an accolade for their commitment, skills and superiority in what must rank as one of their best games ever. After three Saturdays without any games, due to bad weather, NCC hosted Diamonds. Under a glorious blue sky, rather spoilt by a cold wind, the visitors kicked off, with first use of the slight slope. In the opening minutes NCC made most of the running, with Andy Hill seeing his long-range effort pass the right-hand post and Adam Slade sending a shot straight at the keeper. On ten minutes Diamonds came down and forced an impressive save from Aaron Brown, who jumped, with outstretched arms, to prevent a dipping volley from creeping below the bar. Then another Andy Hill effort was pushed behind by the keeper, as he knelt to guide the ball to safety. From the resulting corner Ian Jones, positioned just outside the area, headed wide of the crowded goal. Minutes later his direct shot was successfully grabbed by a diving keeper. Following a rare attack from the visitors NCC was again at the other end, only to see the colourful keeper make another good save. The second quarter began with Diamonds being awarded another free kick, one of several in the match, which saw the ball bobble about in the NCC area, before it was cleared. Action at each end saw both keepers make further saves as the game entered a brief period of parity. The visitors exhibited some brilliance as they advanced down their left, winning a throw-on, and then a corner. After Diamonds failed in an attempt at a scissors-kick NCC charged up-field yet again, only for the keeper to make a brave save from the feet of Ian Jones. Diamonds created two quick attacks, the second saw the ball moved down the left wing, and then crossed. 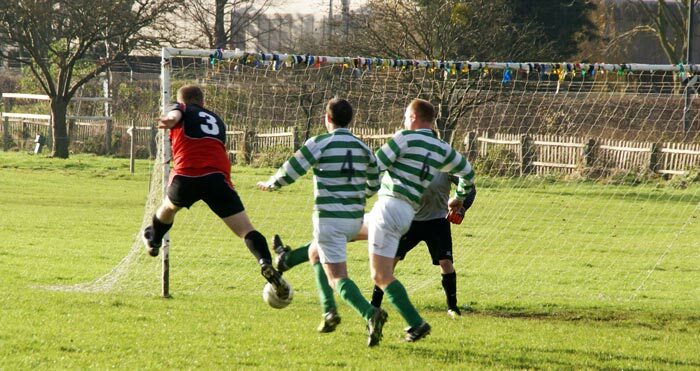 Here a scintillating effort sped over the home defence, only to crash onto the crossbar. It rebounded downwards, in front of an empty goal, for the beaten NCC keeper to collect, head high. This was followed by the ball being sent up the left, where it was crossed to Peter Vaughan-Shaw, waiting near the left post. Shunning off the defender with great dexterity, Peter was able to thrust the ball beyond the keeper, and into the net. At last the deadlock had been broken, and NCC, deservedly, had taken the lead, with half-time beckoning. In the final minutes before the break NCC moved up a gear, and had two more efforts successfully pouched by the visiting keeper, and then saw Adam Slade put his chip over the bar. As NCC won a corner, which saw a long-range threat held by the keeper, so the half was brought to a close. Diamonds made the initial running as the second half began, but were soon on the defensive, as NCC won a corner, on their left. A high ball descended towards the back of the box, and eluded several players before a further shot was collected by the diving keeper. NCC continued to dominate the game, gaining another corner on the opposite side and having Tom Hardcastle blast a twenty-yard effort over the bar. NCC won a third corner, which posed a great threat as players endeavoured to send the ball, first one way, and then the other way. Eventually it was sent over the goal, and Diamonds were able to breathe a sigh of relief. Not for long, as Ian Jones demonstrated his skills before he was closed down, and Tom Hardcastle had his drive put out, for another corner. Immediately the ball went behind, for yet another NCC corner, this time taken on the right. The descending ball was skilfully pushed away by the keeper, not far, and became a potential threat until it was sent wide of the post, for a goal-kick. The third quarter ended with a taste of what was to come. Peter Vaughan-Shaw sped through one of the many open spaces left by Diamonds. Initially denied, then he was able to drill a long diagonal volley towards goal, only to see the alert keeper make a successful save. Minutes later the keeper gathered another NCC stab, and his efforts were giving Diamonds hope with the current score-line. At the other end the solid home defence both shielded their keeper and enabled the ball to be returned downfield so much quicker than that demonstrated by their visitors. As play entered the final quarter so the game went in the right direction for NCC. On sixty-seven minutes Tom Hardcastle had the ball, on the edge of the centre-circle, and delivered a pass to his right. Everything happened so quickly, as the ball fell to the feet of Peter Vaughan-Shaw. His long-range diagonal shot was meticulously directed, and the ball sped past the advancing keeper, and a quintet of defenders, all desperately returning goal-wards. The ball easily won the race, and was only stopped as it bulged the far corner of the net. Minutes later another NCC attempt was saved by the keeper, who was ably demonstrating his ability as NCC continued to give him goal-keeping practice. We saw Aaron Brown gather a soft Diamonds effort, to give him a rare touch of the ball. At the bottom end NCC won another corner. Brilliantly taken, showing great thinking of the current game, the ball was sent towards the back of the box. Here a deftly-struck volley whistled beyond, and above, the left-hand post. During the following minutes NCC had two further efforts clear the opposition bar. Then, exactly at midday, Ian Jones attempted a run, on the far right. As he was denied by a defender so the ball fell in front of Peter Vaughan-Shaw, slightly nearer the goal this time. Almost déjà-vu, as his right-foot again drilled a diagonal ball into the far corner of the net. With this strike, and amid great NCC jubilation, he had completed his hat-trick, made the game more than safe, and endorsed his accolade as man of the match. Two minutes later Peter was denied a fourth, as his repeated effort was driven straight at the keeper. Then Adam Slade delivered a lob from just inside the box. Although sent over the heads of two defenders the keeper, falling to his left, was able to push the ball behind for a corner. As the final minutes ticked away NCC was camped in the opposition goal area, with players queuing up to take pot-shots; all to no avail. Now Diamonds, in an attempt to put some respectability on the score-line, spent the final minutes deep in the NCC half. During this period a volley thundered off the cross bar, and back into play, ensuring a final score-line more reflective of the NCC dominance throughout the play. Not a classic match, but a game which saw NCC notch up a hat-trick of wins over Diamonds, and so complete their first double; also this was the third consecutive game in which an NCC player himself had scored a hat-trick. The team’s continued all-round performance maintains their undreamed-of league position, something that is now becoming second-nature. A chuffed and intoxicated Michael Wyatt reporting from the Stade De Prestbury. On an overcast day, with the promise of the sun, NCC kicked off this game against Trinity & Quedgeley. Playing up the slight slope and, in places, tacky surface, the Hoops attacked on their right. Play switched to the other flank, and then returned across the field. Here, after three minutes, T&Q was awarded a free kick, just beyond the box. A well-struck low dipping ball sped through a gap beyond the four-man wall, and entered the net just inside the post. Most of the next ten minutes saw NCC dominate play, and during this time they made several attempts to score; their efforts were taken by the keeper or narrowly missed the posts. Adam Slade saw one of his drives well deflected by the keeper, and go behind for a corner. The visitors spent some time penned inside their box before the ball was finally cleared. Then, at the other end, Adam Slade drilled a shot between two defenders, and watched with delight as the ball bulged the netting, to tie the score. 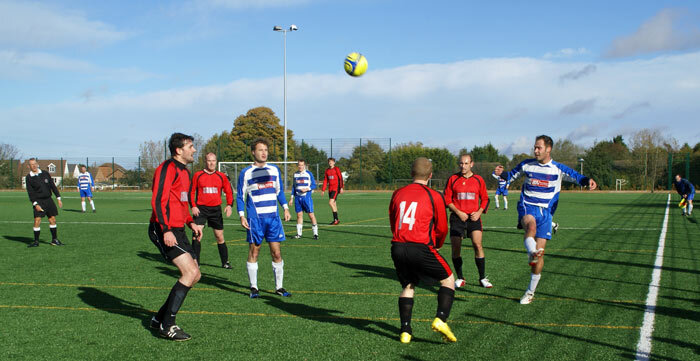 Play moved up a gear as the teams began to shrug off the effects of Christmas! 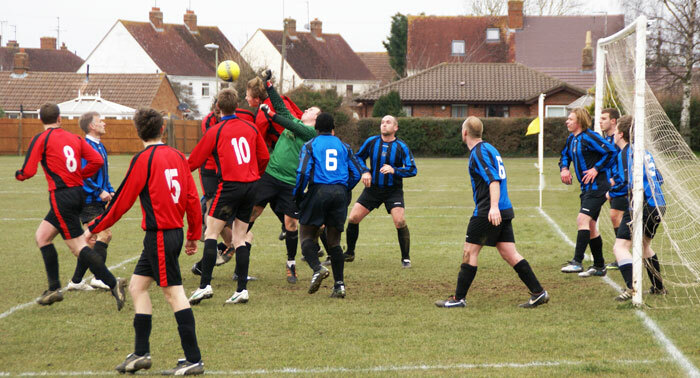 Action alternated between the ends of the pitch; first NCC defended a determined foray before their attack ended when Jon Craxford saw his effort cross the face of the goal, with the keeper stranded. Then, on eighteen minutes, T&Q went down their left and a long range twenty-five yard shot, sent rather speculatively, went into the corner of the NCC net, with Aaron Brown rooted to the spot. Now the hosts started to play dominating football, and began what was probably their best spell of the game. Repeatedly they came at the NCC, who stood solid and nullified every effort. After twenty-four minutes T&Q was awarded another free-kick, some twenty yards from, and opposite to, the NCC goal. The excellent shot was met by a jumping Andrew Murton, who headed the ball out. After some anxious moments this was collected by Aaron Brown, and then sent up field. Here Andy Hill was able to hit a long diagonal drive past the despairing dive of the keeper, into the net, for NCC to level for the second time. Two goals apiece, and after one quarter of a fairly balanced game, what will happen? For the second quarter of the match attacking play rotated as the teams provided an exciting game, especially for the neutral spectator. T&Q, the more potent, began with a corner which Emlyn John headed clear before the ball was grabbed by the NCC keeper. A second attack saw the ball cross the NCC goalmouth before it was collected by Aaron Brown, and a third effort was intercepted by Andrew Murton as he tackled a threatening forward, allowing the visiting defenders time to regroup. Two minutes before the interval T&Q, who had spent some time within their opposition half, delivered a high cross from their right. Missed by the defence it was drilled into the net from close range, and hit so hard that the ball rebounded out. After a brief NCC attack the whistle went for half time. Although T&Q restarted the match the second half belonged to NCC, who scored three goals, as well as having another disallowed, to no reply. In the forty-eighth minute a good pass found Andy Hill, waiting short of the box. Dribbling the ball he eluded a rapidly-approaching defender before sliding the ball beyond both player and keeper, and into the net. Now NCC came to the fore as their opposition appeared to tire, and they had a corner where by the home keeper took the ball in front of an advancing Adam Slade. Five minutes later Jon Whitlock passed the ball to Andy Hill. Turning, the latter outpaced both keeper and a defender, before sliding the ball home, only to be ruled offside. NCC defended in depth, and T&Q had no answer to this, as their few route-one efforts were consistently, and ruthlessly, seen off. T&Q won another free kick, from near the corner of the box, but this was sent harmlessly across the field. Andy Hill was becoming a lone spearhead, and on one occasion he advanced towards the box, only to be met by the keeping who was rushing out. Unfortunately his lob-effort saw the ball sail high over the bar. T&Q mounted a solo effort up the right, and a shot was fired in. Fortunately Aaron Brown was so-positioned that the ball rebounded off his boot, to be returned down field by Jon Craxford. In the sixty-fourth minute man of the match Tom Mangan, waiting on the right, received the ball. From the edge of the box, and with two defenders rushing back to cover the large empty void between him and the keeper, he sent over what must be a cross between pure conjecture and a mishit. To his surprise, the team’s delight and the opposition’s abject horror the ball found its way between the keeper and the near post. As the keeper held his hands aloft in absolute shock the ball rebounded back beyond the line. NCC’s hard work was rewarded with them taking the lead, deservedly if rather fortuitously. This was Tom’s opening score for NCC. Jon Whitlock and Andy Hill had further efforts denied before Adam Slade saw his angled shot narrowly miss the top corner of the net. As the sun returned to illuminate NCC’s dominance it was able to see Andy Hill complete a deserved hat-trick. Receiving the ball when in front of a post he was able to swivel, deny both the keeper and two advancing defenders, and send the ball into the far corner of the net. Almost immediately T&Q had parity in another attack, but Andy Macauly was on hand as the ball went behind for a corner. Safely cleared the ball was returned downfield, where Adam Slade volleyed it straight into the hands of the home keeper. Shortly after this NCC sent the ball over the bar, following a corner, then Dan Higgins volleyed a shot just beyond the left-hand post and Tom Mangan saw his cross, from near the corner, speed behind the back of the net. Although NCC relaxed for the final five minutes they were able to deny T&Q any further goals. The hosts tried overhead kicks, and won a couple of corners, one being the last kick of the game. This late seasonal present, graciously received on the twelfth day of Christmas, saw NCC gain their first-ever double over T&Q, and gave then a great start to 2013. On a damp morning, which threatened both rain and sunshine, NCC kicked off this match, wearing their familiar green and white strip since the Dons were sporting their new red kit. Despite playing up the slope and into the sun NCC got off to a dream start. In the second minute Adam Slade sent the ball to Mark Broekman, waiting just outside the D. As the home keeper came out, to reduce the angle, so Mark drilled a right-footed drive into the far corner of the net. Following the next NCC attack, which saw the ball saved, the Dons moved up a couple of gears. Gaining two quick corners, down their right, they blazed over a very high ball, reminiscent of reports of the Norman archers firing high-angled arrows at Hastings. Did they hope to dazzle the NCC defenders as the ball dropped? Following end-to-end play the Dons had a throw-on, well inside their visitors’ half. A long throw was taken, and as the ball approached the crossbar, Aaron Brown managed to jump and parry it with his left hand. Unable to hold the ball an alert player was able to poke it into the net, and so tie the score. From the restart Mark Broekman mounted a valiant solo run through the middle, and then, as the Dons’ defence arrived, he unleashed a shot towards the target. Although the keeper was caught off-guard he was fortunate as the effort hit the left-hand post. For the next twenty minutes NCC mounted almost three attacks for every one they defended, and yet they failed to capitalise on their superior possession. During this time the Dons’ keeper made one fortunate save when the ball cannoned off his boots, and ballooned up to safety. Three other notable efforts from NCC saw a shot cross the goal, with the return hit behind, Tom Mangan head over the bar and Simon Trew being upended as he ran towards the goal. After thirty-two minutes the Dons penetrated the NCC defence, and won a throw-on. Another potentially-lethal long-throw was taken, and the ball sped towards the NCC goal. As Andy Macauly endeavoured to nod it away so his head gave the final flight a gentle tweak, enough for the ball to deceive everyone and finish just inside the net; now we had a game on. For a five-minute interlude the Dons were in control, and made a series of surging runs down each wing, with alarming alacrity. During this brief period the Dons took another corner, and again a descending ball was sent over, but the visitors were aware of the threat, and so it was successfully dealt with. Then NCC came up their right, where the ball was crossed to Andrew Murton. As he jumped, and attempted to turn and head the ball in one movement, it fell kindly at the feet of James Stevens. With great aplomb, and rapturous delight, James stabbed the ball into the back of the net, giving the keeper no chance; the Dons’ short reign had ended but their dilemma was just beginning. NCC created a brilliant move which led to a series of half chances. They came up their left, and won a corner. Adam Slade delivered a well-flighted ball, which continued beyond the end of the unguarded goal. Immediately the ball was returned from the right, where Mark Broekman saw his header partially cleared before being booted down-field, and to comparative safety. Andrew Murton was becoming the nemesis of the Dons as he mounted a series of piercing runs; with one effort well saved by the keeper diving to his right. On the stroke of half-time he sped up the field, and moved further to his right to elude an encroaching defender. Finding both time and space he then sent over a delicate cross. This was parried by the keeper, by now on his knees, and then mis-kicked by another defender. The ball fell kindly to the feet of Mark Broekman who was able to direct it skilfully into the side of the goal, and away from four powerless defenders. The Dons began the second half with a brief incursion, but then suffered a double hammer-blow, as NCC scored twice within a couple of minutes. First Adam Slade sent in a long range shot from the edge of the goal-area, and then Simon Trew replicated this, to ensure the current league leaders remained on top over Christmas. Andrew Murton was denied as he came down the left, and then Paul Schwan headed the ball over both bar and a packed goal-area. As NCC continued to taunt their hosts the Dons’ keeper was given plenty of practice, and successfully clutched one effort to his chest and grabbed another as he rolled away from a charging Tom Mangan. Soon after two unsuccessful runs up the slope by the Dons down came the rain; and as the ground became tackier so the three-goal cushion NCC had created became a millstone for the Dons. Although they made the occasional visit to the NCC end, one causing Aaron Brown to make a brilliant left-handed save, and another saw Simon Trew head out, it was almost one-way traffic. In the sixty-fourth minute NCC sent a high free kick into the six-yard box. A trio of attackers were waiting, but Simon Trew jumped first and headed the ball into the goal; the Dons were hit for six. The NCC players were hungry for more goals; none more so than Andrew Murton; yet another run saw his effort almost graze the post as it sped by. Then, in the seventieth minute, a good ball found Andrew Murton. He dribbled past a defender before unleashing a shot which put the ball into the top corner of the goal; rewarded at last. 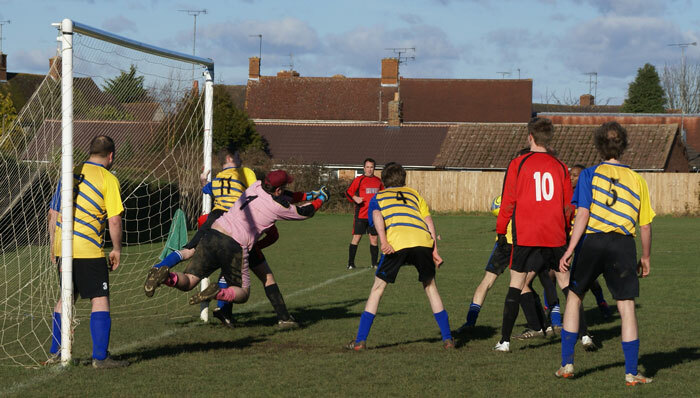 By now the ground, and the ball, were becoming quite slippery, and the Dons’ keeper did well to make another series of saves, including one when he dived into the mud-hole marking the middle of his goal. It was better at the top of the field, especially away from the goal, as Aaron Brown found when he took the ball in front of a post. The commitment shown by both sides, despite the conditions, driving rain and score line, was further demonstrated with ten minutes remaining, which produced another clutch of goals. The Dons began this spree with an attack up their wing, and then drilled the ball towards the NCC goal. Aaron Brown parried the ball but an alert attacker was able to take the rebound further, and then slot it home. Almost from the restart man of the match Adam Slade delivered yet another long-range shot, which sped into the far corner of the net. No sooner had the referee put away his note-book than he was taking it out as Simon Trew sent a left-foot shot beyond the reach of the keeper, to notch his first-ever hat trick, and take the NCC match tally to a new record. As the sun reappeared so did the Dons, who won a couple of consecutive corners. Here they repeated the high descending ball, but to no avail. The final act of this eventual one-sided contest demonstrated the potential of the Dons, as Simon Trew headed out a powerful corner from a packed goal-area. On a beautiful crisp and sunny morning NCC kicked off this match, and was immediately on the attack. They spent the opening five minutes deeply entrenched in their opponents’ half. Although Andrew Murton, Ian Jones and Tom Hardcastle created a series of flowing movements the Cirencester defence remained solid, before they in turn mounted a brief incursion to the other end. On ten minutes Peter Vaughan-Shaw saw his attempt sail over the bar, and then the visiting keeper coolly grabbed the ball, following a cross from the left, with both Ian Jones and Peter Vaughan-Shaw bearing down on him. In the space of a few minutes NCC was awarded two free kicks. Forwarded deep into the bottom part of play the first was sent over the bar and the second was miss-kicked. Cirencester made a brief counter-attack, which saw the ball safely gathered by Aaron Brown. Their next try, this time up the left wing, was easily seen off as the keeper rushed out to boot the ball back downfield. An effort from Tom Hardcastle went behind for a corner, which was only partially cleared before Ian Jones, from out of the blue, and in spectacular style, threw himself at the ball as he sent a superb shot whizzing over the bar. This was followed by the Blues’ best attempt so far, as their lone forward was tackled by last-man Jon Craxford, resulting in a corner. This was over-hit, and from the clearance the Reds sped down their right wing. Several players were completely unmarked, allowing NCC to cross the ball in front of goal. Here Ian Jones, on hand, was able to return the ball with a deft header. Tom Hardcastle ran into the empty space in front of goal, and sent the ball into the back of the net; after twenty-two minutes the relentless NCC pressure had borne fruit. 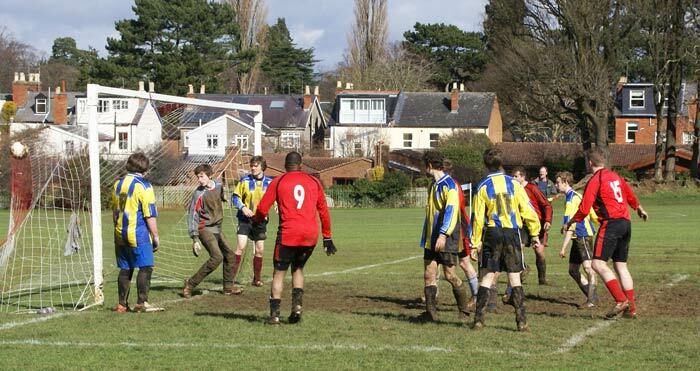 North Cheltenham continued their persistent pressure, initially with Peter Vaughan-Shaw going down the left where his cross was safely gathered by the goalie. Then the Reds came through the middle, but the ball sped over the ground and beyond the far post. Finally the hosts completed their choice of options with a run down their right. Man of the match Andy Macauly delivered the ball to the edge of the box where it was received by Andrew Murton. His effort was parried by the keeper, diving forward. However, with the keeper prone, Ian Jones gathered the loose ball and sagaciously lifted it into the roof of the net, to double NCC’s lead. to the goal line, behind the powerless still prone goalie, and entered the net just by the opposite post. NCC continued their devastating superiority with a further five clear opportunities; two were over-hit and the others were well caught by the Cirencester goalie, who was keeping the score-line respectable. This was followed by a short interlude when Cirencester made a brief attack. Five minutes before half time Ian Jones sped through the opposition defence before passing the ball to Andy Murton. Positioned some twenty yards out he unleashed a fierce diagonal shot, angled towards the far corner. The keeper, remaining on his line, was deceived by the direction of the ball, and threw himself forward in his effort to remedy the situation. Flat on his stomach he could only watch as the ball continued beyond his outstretched hand, hit the far post and rebound almost parallel to the goal-line, and behind his prone body. The ball sped towards the far side, and fortuitously hit the net just beyond the other post, to give the hosts a comfortable cushion. As the final minutes of the half passed NCC created three more scoring opportunities as they hit the side netting, saw one effort narrowly pass the far post and had another well held by the goalie. It was two different sides who took the field after the break. NCC relaxed somewhat but Cirencester, although not at their best, had moved up a gear; and we witnessed a much quieter and less exciting half. Early on, as a taste of what was to come, Cirencester was awarded a free kick from inside their half. The high ball descended into the box but was knocked wide for a goal kick. On their next break the visitors came down into the corner but were unable to get behind Paul Schwan. 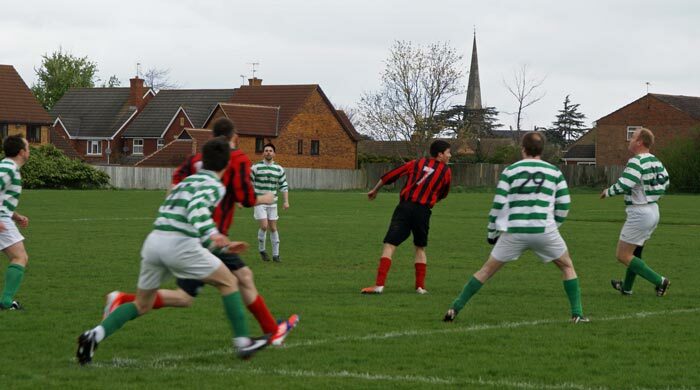 For their part North Cheltenham Churches spurned an opportunity as a cross was sent wide of the far post, and Ian Jones, before his substitution, had his effort closed down. Just past the hour mark NCC went up their left. As the keeper came out, too far, so the ball fell kindly to Andrew Murton. Approaching the edge of the box he unleashed a drive, but an alert defender had spotted the situation, and placed himself on the goal-line. With a cool head he calmly nodded the ball clear; fortunately for his team there were no Red players within shooting distance. Minutes later the Blues were awarded a free kick, from inside their half, and just outside of the centre-circle, as NCC was caught offside. The high ball came down to a pair of players, both waiting on the edge of the goal-area. Shaking off his marker one forward cleverly lifted the ball over the head of Aaron Brown, and watched with absolute delight as the ball dipped below the bar and bulged the back of the net. Spurred on Cirencester immediately created two further attacks; the first ended when the NCC keeper eventually gathered the ball and the second followed the award of a free kick, which was sent high but straight into the arms of Aaron Brown. Adam Cox demonstrated his dribbling and turning abilities as he ran past two defenders and then positioned himself for a crack, but sent the ball into the hands of the keeper. Following an NCC corner the goalie was fortunate to take the ball after it bobbled around, with him faced downwards. Cirencester followed this up by two attacks; both saw the ball gathered by Aaron Brown; one from a direct kick and the other following a weak cross. At the other end NCC posed a more serious threat as they took a free kick, but the defending pack was able to deal with this. Then, with five minutes remaining, Andy Hill, with his back to the goal-line, was attempting to control the ball when he was pushed from behind. He took the resulting penalty, and sent the ball towards the goal-keeper. By then the goalie was descending onto his left knee, but the ball was speeding towards his right boot. Although the goalie got his boot to the ball he could not deflect it to safety, and the ball ended up in the far corner of the net; thus presenting the kicker with his first-ever goal for the team. The visiting keeper then demonstrated his commitment with a little solo run in his endeavour to send a quick ball down field, and followed this up by a brilliant save as he jumped, with an arched back, and stopped the ball with his right hand outstretched. In the last minute North Cheltenham created one final chance but this was headed wide of goal. When the final whistle was blown NCC had completed their second double over their opponents, and only their fifth double overall. On a cold and frosty morning NCC travelled the short distance to Newlands, for their fixture with Cheltenham Trinity. NCC, playing in their green and white hooped strip, made the opening breaks, with Peter Vaughan-Shaw making a solo run up the right and Adam Cox sending in a long-range lob, which descended behind the goal. NCC continued their efforts, mainly up their left, and won a corner. Then Trinity came back into the game with one shot cleared by Aaron Brown, two others sped by each of the NCC posts and a corner shot was headed clear by Adam Cox; all within the opening ten minutes. During the next fifteen minutes NCC won three corners before Trinity gained two, but none was taxing for the respective defences. Although the players went up and down the uneven and tacky surface with relative ease it was clear that this inhibited a flowing game. NCC was the more skilful but Cheltenham Trinity played some delightful team football; it was becoming an interesting contest of two differing styles. Clearly the home keeper was by far the busier. Although Robin Barker was not a regular he demonstrated tremendous skill in reading the game and making frequent saves throughout the match; he was the difference between the teams. This was demonstrated when he rushed to the edge of his area twice within a minute to take the ball, quite confident to leave his goal unguarded. In the remaining period of this opening half Trinity had a solo endeavour denied just outside of the left-hand post and almost immediately saw another venture sent diagonally across the NCC goalmouth, with the keeper stranded on the opposite side. As the sun made a brief opening appearance so NCC saw the Trinity keeper take two efforts on the extreme edge of his box, before making a save as he knelt to keep his body behind the ball. Much of the play took place around the centre circle, from where NCC was awarded a free kick. The well-directed blast was ably taken by the Trinity keeper in front of his face, as he jumped with a brace of NCC players rushing in. Shortly after this Trinity had a free kick, also from around the centre spot, and this enabled them to spend a little time within the NCC half. 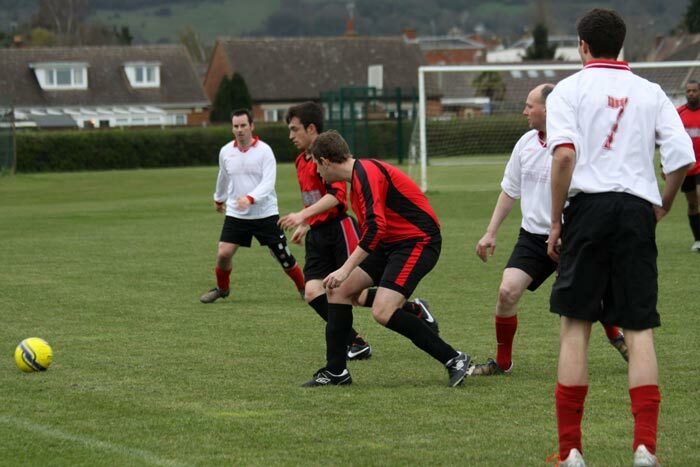 During this brief period of intense pressure Cheltenham Trinity had their best chance of the match, when a lone forward came down the left, heading towards goal. His shot was well denied by Adam Cox, whose aptly timed right foot saw the ball rebound behind for a corner. As the half drew to a close there was plenty of action at both ends, with each defence working well to deny determined runs. The NCC defence was the busier, and cleared several gritty attempts from Trinity; fortunately one sped beyond the far post. Adam Cox is about to bring his boot down onto the ball as the opposition forward hits it. Dan Higgins (4) is on hand. The ball went behind for a corner. NCC restarted the match, and again was on the attack, as they came down their right, where man of the match Andy Hill sent a diagonal shot towards goal. This time the Trinity keeper was fortunate, as he had come out too far. As he retreated he watched, with great relief, as the ball sped by his far post. At the other end Aaron Brown miscued a kick as the opposition was charging in, but the NCC defence eventually tidied up. For much of the middle third of this half NCC made the running, but was unable to score. At least half a dozen efforts ended up in the arms of the Trinity keeper, again one as he sped to the very edge of his area. 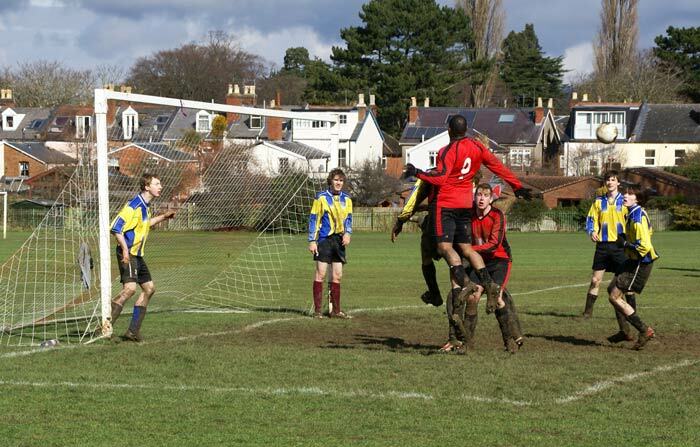 When NCC had a corner the opposition packed their defence with players, thus restricting both visibility and mobility. In the final third the Trinity keeper took another jumping catch in front of his face as Simon Cozens was positioning himself for a header. Then he denied Emlyn John a chance as the NCC player beat him to a diagonal ball. As the half finished NCC gained two successive corners, which came to naught; it could be argued the team ought to have positioned men behind the pack, and tried a different tactic. Although the match ended with a flourish at each end there seemed little likelihood of either side scoring. Despite their numerous attacks, approaching fifty percent more, NCC might feel the more aggrieved, but I think a draw was a fair result. For NCC history was made; this was their first-ever 0-0 score in one hundred and thirty two games, including both league and cup. On an overcast day NCC visited The Burrows, where the delightful sound of the bells of Leckhampton church eased through the last remaining colours of autumn. As the tunes drifted across the ground, and into the ears of the teams, the football players may have thought the bells were playing Me and My Goals! Not so for NCC, as yet again they got off to an appalling start, and found themselves two goals behind. From the kick-off Cambray attacked with a ruthless and non-stop display of forceful and skilful football. NCC was hit by a blitzkrieg, as their opponents rushed down both wings with effusive equanimity, adding several aerial and diagonal balls, which allowed penetration of the team’s defences almost at will. The writer cannot recall ever seeing Cambray play such demonstrative football. Their opening burst saw runs down each wing, the award of a free kick and three crosses; the first was saved by Aaron Brown, the next was magnificently blocked by man of the match Jon Craxford, preventing a certain goal, and the third was cleared by Adam Cox. This was followed by Cambray gaining two consecutive corners. A very brief respite followed as NCC sent the ball into their opponents’ half before the onrush returned with increased ferocity, as Cambray created acres of space and won another corner, with their attempt going wide. Then, as the tenth minute came, so did Cambray. A charge down their left wing saw a diagonal shot aimed towards the goal. With horror NCC watched as the ball was spilt by the keeper, and continued mercilessly into the corner of the net, a gift to the hosts. Having seen Cambray send another shot over their goal NCC managed to launch an attack, through Peter Vaughan-Shaw and Ian Jones, but this was denied. 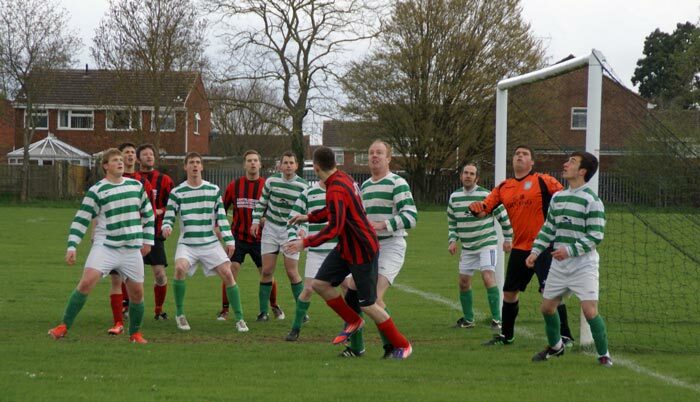 Then Ian led an attack up the NCC right, where they were awarded a free kick. Tom Hardcastle delivered a tricky high ball, and as it descended Ian Jones was well placed to meet it. Initially the keeper, Rob Jones, missed the ball but was able to swoop and hold on to it as several NCC players were arriving. Slowly the Reds were coming into the game, and Peter Vaughan-Shaw made a promising run up the left; it was becoming a game of two teams. Now play alternated as a Cambray corner was followed by Andrew Murton leading a run, ably supported by several players. The hosts were denied again before the visitors went up their left. Here a pass from Peter Vaughan-Shaw was met by Ian Jones, but the brave keeper rushed out and the ball was knocked behind for a corner. Now Cambray replicated their initial skills, and forged a series of forays, mainly along their left wing. After a repeat of the goal-run play was switched to the other flank, and then back again. A shot was palmed over by Aaron Brown, for a corner on the left. Another corner followed, on the right, but the cross was headed out by a jumping Simon Trew. A Cambray header was going in but somehow was kept out by an acrobatic keeper, as he descended towards the ground. This foray was ended when a Cambray crack squeezed over the far corner of the NCC goal. Not for long, as a lone forward surged through the Reds’ defence and waltzed around the keeper, before sliding the ball into the back of the net; this after twenty-six minutes. Cambray, preferring the right, missed-out with three further attacks; one was a desperate clearance by Tom Hardcastle from off the boot of the Cambray captain, before NCC troubled their opponents again. For a while play was centred in the middle and then, on thirty-five minutes, NCC was awarded a free kick. Adam Slade sent the ball to Ian Jones, who delivered a tantalising header. As the ball descended Rob Jones appeared to have it covered, but, to his horror and NCC’s delight, it eluded him and finished up in the corner; now the game was developing into a match. Further NCC efforts saw the Cambray keeper catch the ball whilst poised delicately on tip-toes, and a Peter Vaughan-Shaw run, with a cross to Ian Jones, come to naught. Following the next Cambray attack came a low drive, not held by Aaron Brown, but fortuitously slipped behind for a corner. As the half drew to a close NCC made a series of determined attacks. From one the keeper made a brave stab to deny them, and as the ball bobbled around Andrew Murton had a stab. The ball, almost on the line, was pushed out by Scott Jones, his leg at full stretch, as he went to the aid of his brother. NCC’s next effort saw Andrew Murton denied, as he ended up lying on the floor, allowing the keeper to make a successful save. NCC began the second half with Adam Slade making a rapid run down his right, followed by a cross, which was too high and wide for Ian Jones. Moments later the Cambray captain charged up the wing, and NCC was fortunate as the shot rebounded off the base of the post. On fifty minutes NCC gained a free kick, almost on the half-way line. Adam Slade pumped the ball down-field, towards Adam Cox, who sent a deft header past the keeper, and so tie the score. Shortly after this the visitors nearly scored again, but the attempt was put wide. Then Cambray pounced; a solitary player came up the left and sped past the NCC defence, causing Aaron Brown to rush to the edge of his area to clear the ball. Unfortunately it was intercepted by the Cambray player, and despite the narrow angle he propelled the ball into the far corner, to take the second gift NCC had offered their hosts. This was most disappointing, especially as NCC dominated the remaining half hour’s play, and created the lion’s share of attacks. There was a brief period in which Cambray appeared entrenched at the Reds’ end, which ended with the hosts missing a clear chance as the ball was crossed in front of the goal. Not long after this NCC had a similar period when their players appeared to be queuing up to score; they were creating but not taking the chances. As the game drew to its close NCC had three consecutive opportunities to score, but the Cambray defence was just that bit quicker, and so they were denied. This was another game where the words What if? are applicable; a game NCC must feel they threw away with soft goals, especially after the good battling defensive show they produced; and so NCC slipped to their tenth successive league defeat at the hands, or feet, of Cambray. A nauseated Michael Wyatt reporting from The Burrows. This game was the Clash of the Titans; the top two teams matched against each other. Following the recent deluges the fixture was moved, from a soggy Prestbury pitch to the all-weather surface at All Saints Academy. Throughout the game the sun shone its brilliance, which was reflected in NCC’s play; once they had recovered from a devastating start. NCC took centre and was immediately on the attack, which resulted in Tom Hardcastle sending an effort wide of the far post. Then, after six minutes, St Matthews sped down their right wing, beat the lone defender, and ran towards goal and another defender. The result saw NCC concede a penalty, and then the lead. At the other end Andrew Murton sent a shot wide of the post, and St Matthews survived a goal-mouth melee. From the place kick they came down their right wing again, rounded a defender and sent the ball into the far side of the goal. Then, as the hosts were awarded a free kick a Saints player was booked for dissent. Regaining possession a solitary forward came down their right again, outpaced the several defenders and volleyed the ball beyond the hapless Aaron Brown, to leave NCC facing total humiliation after less than twenty minutes, 0-3 down. Now the fight-back began, as NCC started to adapt to the conditions, and their big boys came into play. NCC pressed through the middle, and won a corner on the right. Although the ball was cleared there were players lined up ready inside the box. Shortly after this NCC came down their right, and won another corner, which saw Simon Trew jump and head a valiant effort wide of the post. Having seen off a further visit from the Saints NCC gained another corner, this time on the left, but the cross was too high, and so drifted harmlessly beyond all. We saw the visitors mount a series of attacks, and gained a corner, which was comfortably seen off as NCC packed their goal area with players. At the other end a goal finally came when Mark Broekman headed the ball into the far corner of the net, giving NCC much-needed hope; and this after half an hour. As played flowed smoothly up and down this fast surface the Saints, preferring the right wing, had three threatening attacks in quick succession. However, NCC was becoming more adept at moving the ball along all channels, with Mark Broekman and Emiliano Cipriani becoming expert at finding a way through the tight defence. Tom Hardcastle and Adam Cox were working well in midfield. A good ball from Simon Cozens found Andrew Murton but his shot crossed the bar, as did a long range effort from Gary Morris. Then, two minutes before half time, Adam Cox, on the edge of the box, and in plenty of space, received the ball. Instinctively he decided on route-one, and a shot rocketed towards the left hand post. The keeper jumped and twisted his arched back in a futile effort to prevent this stunning volley from entering the net, and so bringing NCC right back into the game. The look of disbelief and amazement on the faces of the opposition told it all. On the stroke of the break St Matthews, clearly not relishing the NCC come-back, had another player booked for unsporting behaviour. NCC made the opening move of the second half, gaining a corner from the left, but the high shot sped over all. Then St Matthews forced NCC on the defensive, where both Simon Trew and Aaron Brown made several decisive clearances. Mark Broekman led a great charge down the right, and was heading towards goal before the opposition managed to regain play. NCC had a further attack down the right wing and a good cross was met by Simon Cozens, but he headed the ball over the bar. Moments later St Matthews, in turn, had a shot cross their opponents’ bar. NCC created two further great chances; the first when a good ball from Simon Cozens found Andrew Murton, but it went behind for a place kick. The second chance came when a high cross from James Stevens was well caught by the keeper as he balanced dexterously on his left leg. After seventy-five minutes a through ball was directed towards goal. Andrew Murton and the Saints keeper, on an apparent collision course as both went for the ball, missed all as the ball sped behind, and the opportunity passed. NCC continued in a most dominant vein, and the exciting game was becoming more anxious as the chances came, and went, as did another great Andrew Murton run. Then, with just over ten minutes left, NCC won a corner. Although this was cleared NCC was awarded a free kick, just in from the right hand corner. As Adam Slade sent over a well-balanced cross so Mark Broekman timed his jump to perfection. Despite the close proximity of defenders his powerful header sent the ball crashing down near the post, where it bounced into the far corner, for a hard-earned NCC equaliser. Now the excitement turned the game into a thrilling finale. The St Matthews keeper took two catches, one from a high-descending ball, as NCC spent some considerable time in the goal-area as they searched for the winner. At the other end Gary Morris made a solid header as he cleared the final attack from the Saints, but the concluding action was exercised by man of the match Mark Broekman. A great solo effort saw him run the length of the field before turning towards the goal and unleashing a shot. The ball crossed over all, just below and parallel to the bar. Perhaps NCC felt the more aggrieved for not winning, but we were left wondering what if? A chirpy Michael Wyatt reporting from All Saints Academy. On the first cold day of autumn, accentuated by a stiff breeze, NCC visited Naunton Park for their match with Diamonds. The home side, with the advantage of the slope, started well and created several early chances, winning a corner and seeing a blistering effort, sent from the edge of the box, rebound off a post. After Ian Jones had his shot held Diamonds stormed down their right wing, but the NCC keeper took the attempt by his near post. Moments later they came down again, but a fierce header from Simon Trew, jumping on the edge of the area, saw off this danger. Many of the other threats were cleared by Matt Allison, who worked like a beaver as he tidied up the defence. In turn the Reds sped up their left wing, where a shot from Jon Craxford was directed straight at the keeper. NCC spent several minutes in the top half where they created a couple of chances. Throughout this game play was very evenly balanced, perhaps NCC had the better defence which enabled them to see-off their hosts, and when this failed Lady Luck played her hand. This happened again as Diamonds, having switched flanks, came down their left wing. Their plucky number eleven gained depth, and then turned towards goal. Here he passed three defenders, and, as he approached the near post he unleashed his shot, aiming for the far corner. Tantalising for all concerned the ball sped on, wide of the post; a fortunate let-off for the table-toppers. Moments later he was down again, but this time any threat was quickly nullified, and an aerial shot sailed high over the bar. In turn NCC strung together a series of efforts, notably from Andy Macauly and Tom Hardcastle. Then, after fifteen minutes, Andy Macauly delivered the ball towards his left wing. It was gathered by Andrew Murton, who sent a long ball towards the goal, and then followed it up. The Diamonds keeper, standing near the edge of his area, appeared to have the descending ball covered, despite the threat of Andrew Murton looming ever-larger. However, he dropped, or lost, the ball, giving Andrew the pleasure of putting it into the empty net; an unfortunate error well taken by the alert NCC forward. The hosts were awarded a free kick, a little way beyond the box, but this was sent straight to Aaron Brown, who gathered it comfortably by his feet. At the other end an effort by Peter Vaughan-Shaw was blocked by the sprawling keeper, as players from both sides rushed in. Diamonds worked the ball well down the wings, before delivering threatening crosses. The Reds had another good attack up their left wing, followed by a dangerous ball from the other side, as their players were lining up most judicially. Almost immediately, in this brief period of NCC dominance, another shot soared over the goal line. Then Diamonds came down their right again, and gave the opposition a torrid time as the ball bounced inside the six-yard box. The ball was sent out, only to be returned and present a more threatening period, before the visitors were able to launch another attack of their own. Diamonds created a further moment of threat as the ball was threaded around the goal-area again, before being hit high over the bar. Following a brief NCC visit to the other end Diamonds were awarded another free kick, from almost the same spot as the earlier one. A well-worked move saw the ball pushed towards the far post, where a forward, waiting near the penalty spot, ran in but was unable to propel the dropping ball towards goal. Moments later Diamonds knocked a pass across the NCC goalmouth, beyond the reach of all, including five frantic forwards all poised to receive the charge. Then the table-toppers created a series of opportunities through Andrew Murton, Jon Craxford and Ian Jones. As half time beckoned so we were treated to a frenzied final five minutes. Diamonds stormed down the left, only to see Simon Trew head their attempt clear, before they won a corner. An unmarked attacker was stifled, but won a second successive corner. Déjà vu, as the same player, again unmarked, was able to lean forward and send a delicate header beyond the defence, and towards the top of the net. As he finally fell to the ground he was able to turn and see the keeper’s hand arriving too late to prevent a deserved Diamonds equaliser. The tension mounted as the visitors charged down again. Denied, it was the turn of NCC to launch an attack, through Ian Jones. His shot, pushed beyond the keeper and towards the far post, was stopped by an alert defender stationed there. As the ball was sent out so the keeper sped to grab it, another defender went to assist and both collided, with the ball continuing out, beyond the reach of Andrew Murton. As both keeper and defender got up, and went to their left, they created a gap. An alert Tom Hardcastle, rushing in, was able to drive the ball through this yawning hole, and jubilantly score his first-ever goal for the NCC. There was still time for Diamonds to mount a further effort before the half-time whistle sounded. The second half began at a blistering pace. In the opening minute Diamonds stormed up the wing, where Aaron Brown was fortunate to palm a powerful right-footed shot onto the bar, and behind for a corner. Giving as much as they took NCC created more chances, which saw both Ian Jones and Andrew Murton force the home keeper to make good saves, and then man of the match Simon Trew headed the ball over. After six minutes Diamonds were awarded a free-kick, but this was volleyed straight to Aaron Brown, who held the shot with absolute nonchalance. At the other end Ian Jones broke free in the goal-area, but his effort was sent out by the keeper, who flung himself horizontally to reach the ball inches from the line. A few minutes later NCC gained a corner, which saw Ian Jones put his attempt over the bar. Jon Craxford delivered a high free kick into the box, and the descending ball caused a few moments of panic before it was eventually gathered by the keeper. 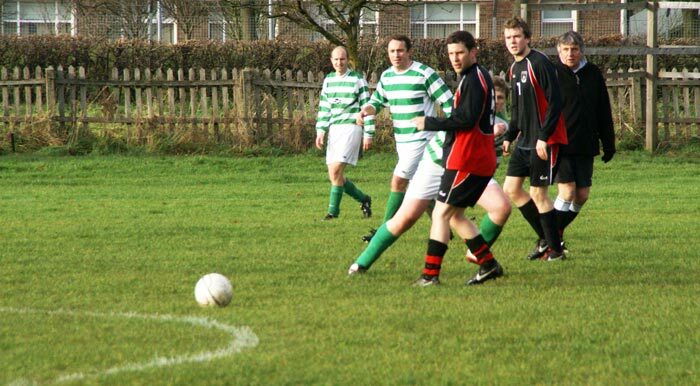 As the game entered its final quarter we saw Peter Vaughan-Shaw leading an attack down the left wing. Another Ian Jones stab rebounded off the home keeper, as he slowly fell backwards. 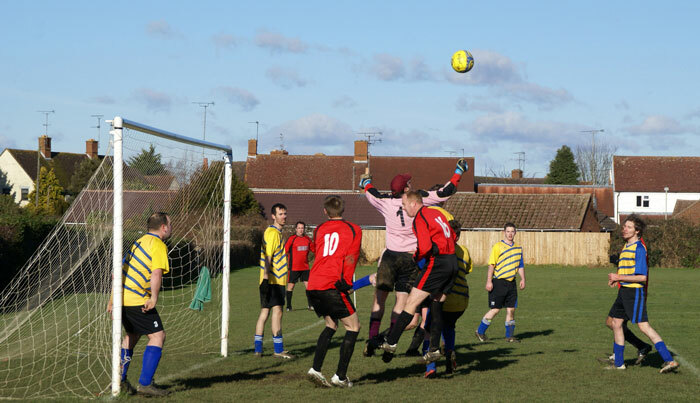 Then Diamonds were awarded a free-kick, but the effort was delivered straight into the hands of the visiting keeper. This was followed by a prolonged attack from the hosts, which saw the ball moved from one side to the other; eventually they gained a corner. Moments later Diamonds almost scored but chose to put the effort over the bar. They volleyed another shot into the area, but this was sent out by Aaron Brown, as he ran to meet the ball, resulting in a collision with an approaching forward. Andrew Murton, down in the far corner, sent over a beautifully balanced cross, but unfortunately this could not be controlled sufficiently, and went behind. In the final few minutes play flowed up and down continuously. This saw Diamonds gain a corner and three successive throws-on. They put an effort into the arms of the keeper and misdirected a further free-kick. At the other end NCC sent over a useful cross from a corner, saw a Tom Mangan effort caught by the keeper and had Matt Allison, down on his haunches, make another fine stop. The closing moments were frenetic, and saw Diamonds gain a corner, quickly followed by a throw-on from the opposite side of the pitch. The resulting effort saw two players from each side jump for the ball, which somehow eluded them all as the ball came back into play. It was sent beyond the goal area where a Diamond player had the final shot of the game, as he volleyed his effort over the bar. On a dry autumnal day, punctuated by teasing glimpses of sunshine, NCC hosted Cornerstone, last year’s league champions. Winning the ball from the onset North Cheltenham was immediately on the attack, but then conceded a free kick, from the half-way line. Play continued in the opposition’s half, each side gaining a free-kick, before the champions advanced, and gained a corner after their long range strike took a deflection. Aaron Brown held the shot as he jumped up, his first touch of the ball, and this after six minutes. Although Cornerstone increased their tempo play was evenly balanced, and flowed up and down the field with a metronomic rhythm, as each side sought to gain an advantage from the tight constraints being imposed. Ian Jones sped up the right wing a couple of times, but his crosses were well cleared by the Cornerstone defence, and another effort was pouched by their keeper. In between the visitors made several attempts to penetrate the NCC line, but Aaron Brown appeared confident as he gathered the ball with a deft assurance, or watched as the occasional shot was hit over. At times Cornerstone was proving a real threat, especially after twenty minutes when a long ball was sent down the middle. From this they nearly scored as the NCC keeper, who had come out, was passed, but Declan Shiels intervened and the ball went out for a corner. This was eventually cleared, but it took two attempts, first by the keeper and then by Adam Cox. NCC gained a free kick but the shot was sent straight to the keeper, who held the ball with apparent ease; minutes later déjà vu after Jon Whitlock had sent over an effort. 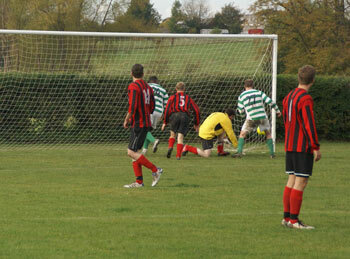 Cornerstone then had two free kicks in quick succession; the first was cleared and the second sailed high over the bar. Just past the half hour mark Cornerstone came down their right wing. They took a throw-on, and then gained a crucial corner. As their players were positioned along the goal-line, and on the edge of the goal area, a high ball was sent over. A Cornerstone attacker, waiting on the line, advanced, jumped and propelled the ball into the far corner of the net, all in one skilful movement. Disappointed, but not down, NCC increased their pressure at the other end, and Adam Slade fired in a shot which was well saved. In this last period of the opening half Cornerstone practised a hit and run tactic, booting the ball up the wings and having it pursued by speedy forwards. Perhaps this was a novel way of holding onto their lead, but it did not prevent NCC from making a series of unsuccessful sorties into the opposition’s end, as the half drew to a close. NCC began the new half and was immediately on the attack, ably led by Adam Slade as he advanced down the left wing, and supported by several players from the midfield. Cornerstone was fortunate to put the ball out after it had bounced tantalisingly across an empty goalmouth; soon after this Jon Whitlock hit the ball behind the Cornerstone line. 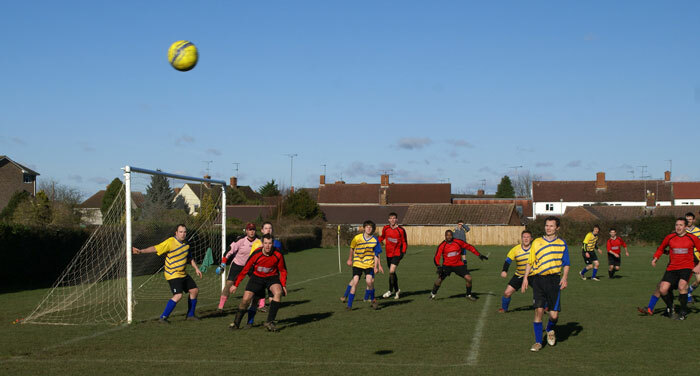 North Cheltenham was playing some delightful football, and gaining control, but without any success; this middle period of play saw NCC dominating at least three-quarters of the proceedings. Adam Cox sent an effort towards goal which was well held by the keeper, as Ian Jones came in, with Adam Slade waiting further out, totally unmarked. Moments later the keeper grabbed the ball from above the head of Andrew Murton. Then Ian Jones, coming down the left, saw his effort held, although both the keeper and a defender ended sprawled along the ground. Minutes later Adam Slade, coming through the middle, had his shot eventually held by the keeper, by now on both knees. As we entered the final fifteen minutes Cornerstone had a rare attack, and sent over a long range diagonal shot, which was well saved by Aaron Brown, as he jumped to clutch the ball from over his left shoulder. 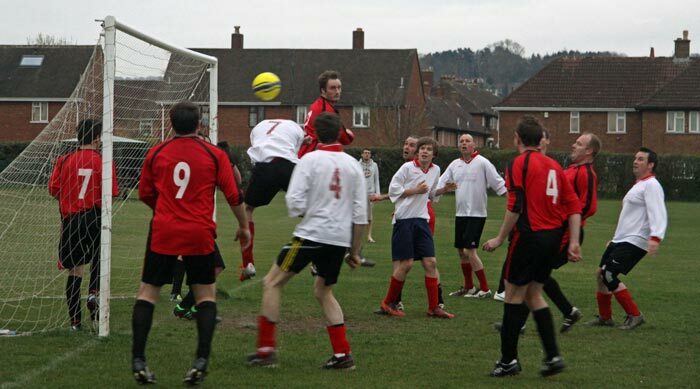 Cornerstone had another free kick, but this was seen off by a jumping Tom Hardcastle, ably earning his accolade as man of the match. Andrew Murton saw an effort pass over an empty net, as the keeper had come out to narrow his angle. A more prolonged Cornerstone attack was eventually seen off, and resulted in the ball reaching Adam Slade. As players rushed down he passed to his right, and the resulting shot was caught by the keeper, standing by his corner post. Moments later another North Cheltenham effort, down their left wing, was denied by a desperate high-lob clearance from a defender. Then, with five minutes remaining, NCC was awarded a free-kick, just outside the box. A high ball was sent towards the right-hand post, beyond all except the keeper, waiting on the line, in the middle of his goal, and Andrew Murton, rushing in from slightly further out. As the ball descended so the keeper held it, momentarily, before the ball fell onto the turf. The ball bounced, or was pushed, towards the post, as both players made a desperate effort to reach it. It is questionable as to whether the ball had completely crossed the line before the keeper grabbed it, and swung and rotated his body in his effort to protect the ball and deny any chance of a goal. It all happened within seconds. A relieved keeper booted the ball up field, but not for long, as NCC advanced again. As Ian Jones crashed to the ground they were denied a penalty appeal. Play continued with the hosts sending a shot just over the bar and out of play. Tom Hardcastle saw his strike ably caught by the keeper near his left-hand post. North Cheltenham survived a final but determined last-ditch effort by Cornerstone. As the whistle sounded NCC was most unfortunate in being denied a deserved draw, but Cornerstone, being assailed for much of the second half, showed, by a combination of luck and able goal-keeping, why they are a formidable side. On a sunny day NCC, playing in their hooped kit, visited Evesham, for their match against Chipping Campden Saints; in reality the second team for Cornerstone. NCC, initiating procedures, was immediately on the attack through Ian Jones. Going for the near post he was denied a heading opportunity as he was closed down by a trio of daunty defenders. The Saints made their initial foray, and spent a little time on the visitors’ left. Then NCC won a corner, but with nine players in defence the hosts regained the ball, and sped up the other wing. Eventually the shot was held by Karl Hemming, sprawled along the deck as an attacker loomed large above him. The home side began to dominate the midfield, and their attacks resulted in several long range efforts being aimed goalwards; one was well saved by Karl. NCC, through Andrew Murton and Emlyn John, also sent long range attempts towards the goal. The hosts, through their speedy winger, whom they fed from well directed passes, made several runs up their left flank, an area neglected by NCC. Thankfully, for the Hoops, a free kick Chipping Campden won on the edge of the box, was totally misdirected, and another long-range effort, dipping towards goal, was easily saved by the visiting keeper. Around the twenty minute mark NCC put on a bit of a spurt, and created a series of half-chances; one was well knocked out by the keeper as he reached up with his right hand, and so denied Ian Jones the chance of a header. Emlyn John sent a free kick away from the goal, where it was intercepted by the defence, massed around the edge of the goal-area. The home side looked the more likely to score as they continued with their penetrating runs and decisive passing movements. NCC had two quick corners, one was put out for a goal kick and the other was cleared by the defence. Ten minutes before half time Chipping Campden created another attack up their left, and won a corner. A high ball, delivered into the goal area, was sent towards the NCC goal. As the descending ball was punched out it fell perfectly for an alert forward, who fired a fierce shot into the unguarded far corner of the NCC net. As the half drew to a close NCC won another corner. 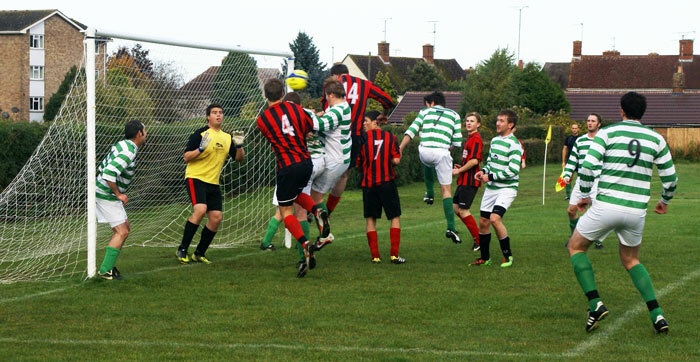 Ian Jones, sandwiched between five defenders, was unable to direct the ball home as he out-jumped all. NCC started the second half brightly, with a series of probing runs, and briefly controlled the mid-field. Chipping Campden directed their players very well, and always had an extra player around. Although their quick attacks sped through the NCC defence they lacked the flair to punish their visitors, and thus allowed their lacklustre opposition to regroup. In the tenth minute of this half they spurned three successive chances, and gave the ball back to NCC. In turn the Hoops created a great chance, but Ian Jones sent a diagonal ball wide of goal. The home side wasted three more great chances, one saw a dipping shot narrowly cross the bar. Winning a corner NCC had four men up, but the opposition had again packed their area with nine players, allowing little chance for NCC to gain any advantage. Then Chipping Campden spent some time at the other end, where, in spite of having half a dozen further opportunities, all were wasted. The first saw a thunderous right-footed shot literally skim the cross bar, as Karl Hemming reached up a fraction of a second too late. Another chance came as the NCC defenders got into a tangle, but the ball was sent wide; further efforts saw chances saved or sent beyond the post. NCC have won a corner, in the 65 minute. As the ball comes over number 18, Emlyn John, jumps up to head it. The Hoops were given a good chance as the home keeper, running to the edge of his area in an attempt to clear the ball, only sent it as far as Peter Vaughan-Shaw. As Peter crossed the ball to Emiliano Cipriani the keeper rushed back to guard his goal, and so was in position to push the ensuing shot round the post for a corner, which saw Ian Jones make a great effort to head the ball in. Again the home side came close to scoring on a number of occasions. One shot was well saved by Karl, with his feet as he was sat on the ground, another saw the ball cross and re-cross the NCC goal and yet a third attempt saw the ball hit the post from close range, when it looked easier to score than to miss. NCC was looking more sluggish as Chipping Campden moved into fourth gear. The home defence saw-off the less-frequent visits by the under-manned opposition, but their forwards were making more and more visits to the other end. Here they hit the crossbar with a thundering crack, and saw another effort sail serenely over the bar. In the seventy-fifth minute NCC had a free kick, on the edge of the Saints’ goal area. With a well positioned wall, set either side of the keeper, the shot was sent wide of the few NCC forwards. At the other end a well-struck Chipping Campden free kick narrowly crossed the bar, with everyone beaten. The home side had another effort saved by Karl Hemming, as he dived beyond the prostrated body of an opposition forward. Even though the hosts were running rampant NCC still managed visits to the other end, albeit infrequent. However, it was around the NCC goal where the real action was taking place; this saw some spectacular misses as well as a series of superb saves. 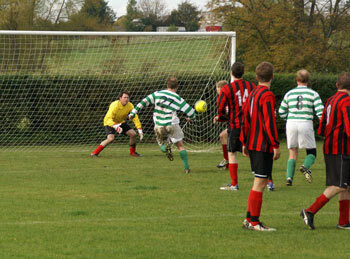 Then, in the final three minutes, Chipping Campden turned their superiority into two more goals. 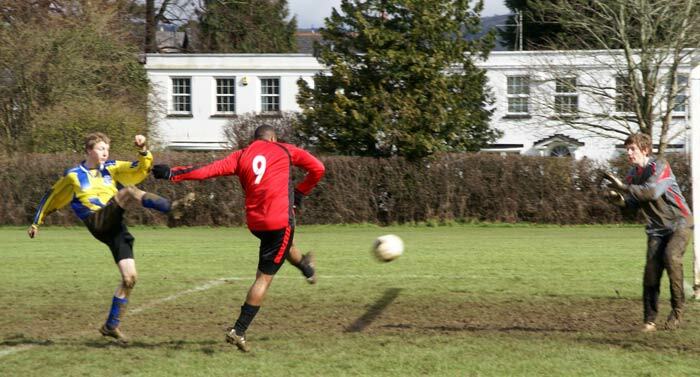 The first saw their number ten run through the NCC defence and send his shot crashing onto the crossbar, yet again. Good fortune smiled, as his attempt rebounded perfectly for him to post the ball beyond the agonising outstretched arm of Karl Hemming. Following a final NCC attack a lone Chipping Campden forward sped down their left wing, easily outstripping the slower defenders. From the edge of the box he unleashed a rising diagonal volley, which sped past the keeper, standing near his post. As the final whistle was blown NCC had lost their first game of the season, and was now facing the daunting prospect of meeting their opposition’s first team in a week’s time. For this league fixture NCC visited a new ground at Innsworth, for their match against St Andrews. Against a colourful backdrop of silver-birch trees, whose autumnal colours were illuminated by the rising sun, the hosts started the game against the current table-toppers; the only team with a one hundred percent record. The opening minute saw NCC make the initial attack, before they conceded territory to St Andrews. Their second attack came when a good through ball was picked up by Peter-Vaughan-Shaw, just outside the penalty box. With only the keeper to beat, although defenders were rushing back, Peter calmly advanced, before selecting his spot. With clinical precision he drove the ball into the bottom right-hand corner of the net, to give his side the perfect start. Minutes later this manoeuvre was nearly replicated but too many defenders forced the ball to roll tantalisingly past the other side of the post. During the next twenty minutes play flowed up and down the field, although to a large extent it was spent on the NCC’s right wing. In this period each team counter-balanced the predictable efforts of the other, as actions were continually created in endeavours to find a momentary weak link. Many areas of the pitch were ignored, and consequently freedom of movement was restricted as the opposition players queued up, allowing the NCC defence time and space to demonstrate their indomitable skill in plugging any gaps, and denying St Andrews a breather. A greater threat was posed when one side made a rare visit to the other wing. From such an attack, down their left, NCC gained a free kick following the booking of a St Andrews’ player. After a seemingly long delay Simon Cozens proceeded with the free kick, but was unable to work his magic of the last outing, and the ball curled high over the bar. Almost immediately St Andrews were awarded a free kick themselves, near the half-way line. With expected predictability the aerial kick was sent straight towards the NCC goal, where Karl Hemming took the catch with great assurance. NCC have just taken a free kick, which curled over the bar, and out to the left. 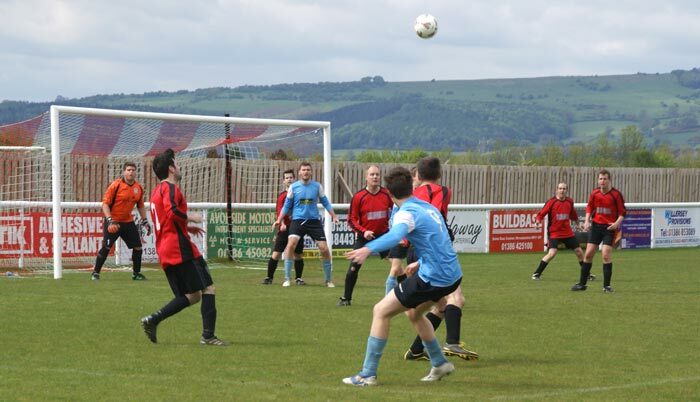 NCC was making twice as many forays towards the opposition goal as their hosts. Approaching the half hour the home side was awarded another free kick, on the edge of the NCC goal area. The ball sped above the heads of all, and headed towards the corner. Unfortunately the ball spilled out of the hands of Karl Hemming, allowing an alert attacker to slide home the gift, and so level the score. Now the tempo of the game picked up. After Tom Hardcastle saw his shot go over the bar St Andrews had the first corner of the game. Easily defended we saw Peter-Vaughan-Shaw make another run down the left, winning a corner. Then NCC conceded a free kick, just beyond their penalty area. As the incoming ball was directed towards the back of the box it was easily gathered by Andrew Murton, as he initiated another foray down the field. Here, following a goal-mouth scramble, the ball was safely collected. As the half drew to a close NCC conceded successive corners. 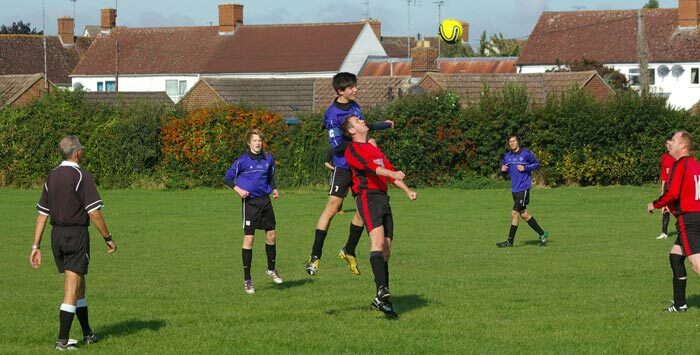 The first was partially cleared, following a header from Matt Allison, before being sent behind by Tom Hardcastle. In a crowded goal area the ball was eventually sent down-field by Adam Cox, and shortly after this the opening half ended, all square. In the opening five minutes of the new half NCC created two good scoring opportunities. The first saw an Andrew Murton shot saved by the keeper, as he put his whole body behind the firmly struck volley. This was followed by an Emilliano Cipriani header which ascended over the bar as he himself descended to perform a spectacular somersault. In the fifty-first minute St Andrews won a corner, out on their right wing. The cross was sent into the middle of the box, thence it was partially cleared, only to fall nicely for the opposition. A shot hit the underneath of the bar, and cannoned onto the keeper before cascading onto the ground. It was deemed that the ball had crossed the line, and so the hosts, credited with another fortunate goal, had taken the lead for the first time. Following this St Andrews tended to sit back and defend this lead; NCC found themselves short in numbers when attacking, and were unable to create many scoring chances. One did fall to Simon Cozens, but the keeper pushed his effort behind for a corner. St Andrews were denied a great chance of victory due to a fine blocking effort by Matt Allison, which went behind for a corner. NCC was relieved to clear this as some of the opposition players were left completely unmarked. A brisk run by Tom Mangan and Simon Cozens outpaced the home defence, but more defenders arrived and put the ball out for a corner; the eventual result being a place kick. In the final twenty minutes NCC moved up a gear, and began to impose greater authority on the game, as they came up both wings. Substitute Adam Slade had a great influence on play, and he made a series of penetrating runs into the opposition goal area, working well with Simon Cozens. The home keeper made several good saves, and NCC made several near misses, one passing just out of the reach of Adam Slade. From a corner Andrew Murton, positioned on the extreme edge of the box, let fly a tremendous low dipping volley, but it dropped too late. NCC, beginning to run rampant, was denied further efforts by the keeper, who was working so much harder than his opposite number. After pouching the ball from a rare piercing attack Karl Hemming sent it up-field. There Peter Vaughan-Shaw forwarded a delicate pass to Adam Slade. Justifying his substitution Adam ran through the opposition defence, before slotting the ball past the keeper, for a deserved equaliser, with less than twenty minutes remaining. 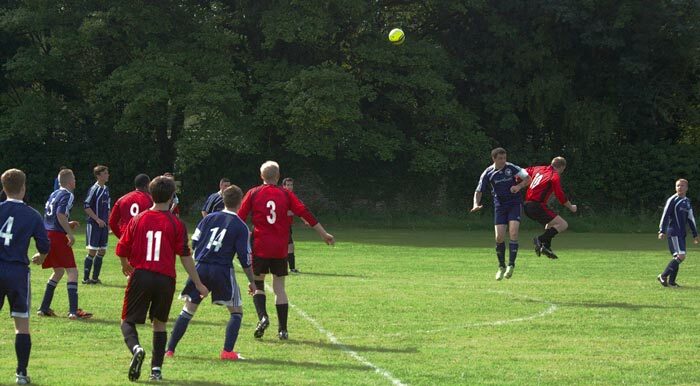 The winning goal, a cracking volley fired by Peter Vaughan-Shaw. As each side now sought their opportunity for a win the game opened up. Both keepers were in action, Karl Hemming took a great ball high above his head as he jumped by his left-hand post to deny a duo of eager attackers. NCC strove even harder; they won two corners, caused the keeper to pull off yet another fine save from close quarters and sent several shots wide. As the game appeared to be heading for a draw we came to the ninetieth minute of this stimulating match. From just outside the penalty area, and fairly near to the goal line, man of the match Peter Vaughan-Shaw collected another good pass before sending a thunderous and stupendous volley towards goal. The only player who moved was the home keeper; in his futile effort he flung himself almost horizontal but was quite unable to prevent the ball from rocketing into the back of the net. With time added on there were still another four minutes of the game remaining, and St Andrews followed this by creating a blistering attack. However, NCC withstood a free-kick, and howls for a penalty, before clearing the ball, to create another attack themselves. As the final whistle went NCC fully deserved their win; they defended better, played more creatively and scored three superb goals; all going to endorse their unbelievable league position. A fascinated and stimulated Michael Wyatt reporting from an Innsworth basking in sunshine. On a beautiful morning at the Stade de Prestbury NCC, playing in their traditional red and black kit, began their second century of league matches, with a game against C3 Dons. Manager Andy Murton had opted to play himself in defence, as the return of Mark Broekman had provided additional attacking options for the team; also back was the familiar face of Tim Rudge, playing in his customary position between the posts. NCC had much of the early play and created several good chances. An early foray down the left saw a chance fall to Tom Hardcastle, but this came back off the post and Adam Cox, on hand, was unable to convert the rebound. A few minutes later Simon Cozens had a stab, but the opposition keeper, who was having a good game, kept the endeavour out. Shortly after this Mark Broekman ran on to a through ball, his first touch took him clear of the advancing defenders but the angle created was too tight for him to get past the keeper. At the other end the Dons always looked threatening on the break, and Tim Rudge was having an equally good game in the NCC goal; one effort was saved as he dived to his left, to deny a Dons breakaway. Unfortunately for the hosts it was the opposition who broke the deadlock in the twenty-fifth minute, with a sustained attack. Whilst Tim Rudge managed to save their first attempt NCC failed to clear their lines, and the visitors were able to pass the ball back to their striker, who hit a low shot to the right of Tim. Although a goal down, and, in your reporter’s view, somewhat against the run of play, NCC started to apply greater pressure on the visitors’ goal. Five minutes later they were rewarded when Simon Cozens sprinted down the left wing, and gained a free kick, just outside the goal area. Simon himself stepped up to take the kick, with several of the NCC players positioned within the goal area. However, the speed, force and accuracy of his effort saw the ball drilled into the top right hand of the C3 Dons’ goal, giving their keeper no chance of making a save. Back on level terms NCC continued to press forward, and five minutes later they took the lead. Tom Hardcastle propelled a well-directed through-ball to Aaron Brown, in plenty of space, as he was running towards the opposition goal. However Aaron still had plenty to do as he controlled the ball before opting to rifle a shot of sheer power. Although the Dons’ keeper made a great attempt to deny the goal the ball bounced off him and squirmed across the line, to end up in the back of the net. NCC tried to put the game beyond reach with further first-half deliveries from Mark Broekman and Jon Whitlock. On the stroke of half time Mark, controlling the ball with his back to the Dons’ goal, managed to turn and hit a clean blast pass the keeper. However the referee judged he had handled the ball and so ruled out the goal. As the half-time whistle went NCC was deservedly in the lead 2-1. Although the second half was goal-less, largely because the teams cancelled each other out; it was still an exciting half with the game delicately balanced. An early NCC break saw them take a throw-on, from their left and on the goal line. Adam Cox headed the ball to Mark Broekman, who in turn headed it towards the Dons’ goal. Somehow the visiting keeper pulled off yet another amazing save to keep their team in the game. The Dons were always dangerous on the break and looked to exploit the speed of their young and attacking players. Tim Rudge was equal to everything which was sent at him and denied the opposition on several one-to-one occasions, once tipping the ball onto the crossbar. Second half substitutions saw participation for Greg Hart-Brown (for Jon Whitlock), Emlyn John (for Aaron Brown) and Tom Fletcher (for Mark Broekman). Manager Andy Murton switched the players around and he and Tom Fletcher assumed the role of strikers, with Emlyn John taking the midfield and Adam Cox moving into defence. Despite some great efforts Andy Murton failed to increase his season’s goal tally. The best of these labours was late on, when a through ball from Emlyn John found its way to him. However under pressure from a defender his shot was scuffed and sailed past the keeper’s right hand post. At the other end the visitors created several chances as they pushed for a late equaliser. Tim Rudge fully deserved his man of the match award as NCC ran out victors, and so maintained their 100% record; a great result again lads – keep it up! An enthusiastic Paul Broekman, cheerfully volunteering for the usual writer, away on his holidays. 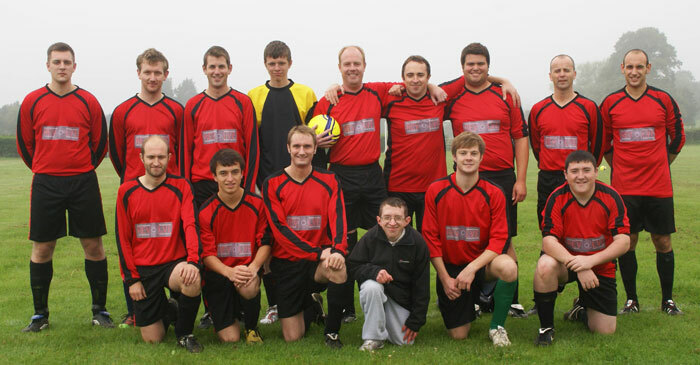 Saturday’s away trip to Cirencester Athletic marked the 100th league game for NCC FC. Unfortunately this milestone could not be witnessed by the club’s most devoted supporters, Edward and Michael Wyatt, who have been on the sidelines for most of the club's first 99 league matches. Everyone involved with the team would like to thank Edward and Mike for the tremendous support they give us each week, and the fantastic match reports and photos; so that explains why this week’s report is not up to the usual standard! The match kicked off under perfect conditions; the sun was shining, there was barely a breeze and the pitch was a credit to the ground-staff. NCC started very well and could have gone ahead in the first minute as Ian Jones raced into the Cirencester penalty area and looked ready to score, but the Cirencester keeper showed great awareness and came off his line to sweep the ball away to the safety of the nearby trees. Five minutes later it appeared NCC had gone a goal down. A very good passing shot from Cirencester opened up the right side of the NCC defence, and the resulting cross was calmly sent into the NCC net. However, an offside flag had been raised early in the move, and so the goal was ruled out. Although it was a thankful let off for NCC it was quite harsh on Cirencester. Undaunted, Cirencester pressed forward again and again, and their number nine looked threatening with his quality touches. However, each time they advanced the NCC defence, and Matt Allison in particular, stood resolute and nullified the threat; no wonder he was awarded the man of the match accolade. One such clearance led to a long ball being sent forward by Simon Trew which Andy Murton latched on to, and then he outpaced the Cirencester back line and confidently put the ball into the back of the net. This was hard on Cirencester, who generally had played the better football in this opening twenty minutes, and had enjoyed the lion’s share of possession. The goal gave NCC a much needed boost and it began to look as if they would take control of the game. Some good play inside the Cirencester penalty area led to a snap-shot from Andy Murton, which was well saved by the home keeper. Shortly afterwards Ian Jones went tumbling in the box but his claim for a penalty was waved away. Cirencester began to impose more of a physical presence and this seemed to rattle NCC. The game became very scrappy but generally Cirencester began to enjoy more possession again, but they could not breakdown the NCC defence. Towards the end of this half Ian Jones went on an amazing and seemingly never-ending run, but when his shot eventually came the keeper was equal to it! The half-time score stood at 1-0 to the NCC. NCC started the second half brightly, with shorter and sharper passing and enjoying greater possession. They won a corner which fell nicely to Andy Murton, whose half-volley whistled just over the bar. Another chance came to Simon Cozens but the young gun blasted his shot wide. Unfortunately play then began to become scrappy again, with no one able to show any composure on the ball; changes were required. Jon Whitlock was the first player off the bench, coming on to replace Emiliano Cipriano on the midfield right. Five minutes later NCC was forced to reshuffle their back four when Simon Trew had to withdraw with a sore neck. Alex Wilkins moved from left back to centre half and James Stevens showed his versatility slotting in at left back, and immediately neutralising the threat of the fresh legs which Cirencester was showing, having just made a change on the right wing themselves. As the half wore on Cirencester was launching more and more direct balls at the heart of the NCC defence. It seemed one such salvo had pierced the NCC back line and Cirencester were poised to level when a fantastic challenge from Matt Allison saved the day. With twenty minutes left NCC made their last tactical change, bringing on Adam Cox in central midfield for Peter Vaughan-Shaw, who had worked his socks off all day. Having had the benefit of being able to watch the first seventy minutes from the touchline, Adam Cox urged his team to show more composure and keep the ball lower. Then he led by example, splitting the Cirencester defence with a simple through ball sent along the ground to Ian Jones, who calmly despatched the ball into the back of the net, to seal the game, with ten minutes remaining. Cirencester was now a beaten team and NCC dominated the last quarter of an hour. 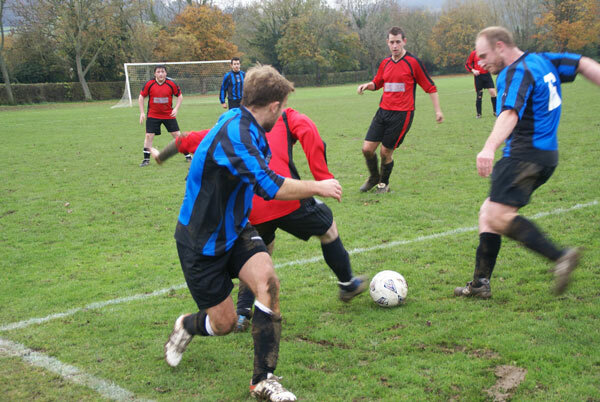 Simon Cozens delivered a tremendous cross from the left which Jon Whitlock couldn't quite steer into the net. With five minutes of play remaining Adam Cox dispossessed the Cirencester midfield of the ball and proceeded to exchange some neat passes with both Ian Jones and Andy Murton. Having received the ball back Adam burst at a pace (for him!) and arrived in the Cirencester penalty area. Here he stroked the ball smoothly into the far corner of the net, to notch up his first-ever goal for NCC, well done Adam. This sealed a 3 - 0 win and all three points. After the previous day of brilliant weather the start of the new football season dawned extremely foggy. Distant views of the nearby hills had vanished into the mists as Trinity and Quedgeley kicked off this match. Although NCC made the initial foray play rotated as both teams took turns to test the opposition’s defence. From a counter-attack NCC gained a free kick, almost on the half-way line. Emlyn John fired a long range shot, but straight at the keeper, who had no difficulty in making the save. T&Q sent an attempted volley high over the bar, and then, from the poor goal-kick, they collected the ball and the speedy number seven rounded both the defence and Karl Hemming, before slotting the ball into the net. Within two minutes NCC thought they had scored but the apparent goal was ruled out for offside. In the fifth minute the NCC goal is under attack, but this was seen off, but not for long!! Around the twenty minute mark each side had a high ball narrowly cross the bar, and much of the play took place around the centre-spot, with both teams breaking out as they attacked along their wings. NCC made the opposition keeper work hard in making several saves, especially from Tom Fletcher and Andy Murton; the latter forced the keeper to dive full length and, rather fortuitously, he was able to push the ball behind for a corner. T&Q created a series of sorties before NCC was able to return to the other end. On twenty-four minutes the visitors were awarded another free kick. The ball was sent up the right wing where a low pass was directed across the goal-mouth, for an unmarked forward to repeat the earlier goal, and so put T&Q two up. During the next twenty minutes, or so, NCC was unlucky in several efforts, notably when the T&Q keeper mishandled the ball, which went behind for a corner, also when Greg Hart-Brown was beaten in a chase to the ball in front of goal, and when Andrew Murton sent his shot over the bar. At the other end Jon Craxford did wonders in defence as he tidied up from several determined attacks, and Karl Hemming made a great save as he knelt with his body firmly behind the ball. On forty minutes another push, from the visitors, saw them score with a volley struck from the edge of the area. Although the prospects were looking bleak T&Q was denied further success by Karl Hemming, growing in confidence as keeper. Just before half time fate intervened as NCC created another counter-attack. 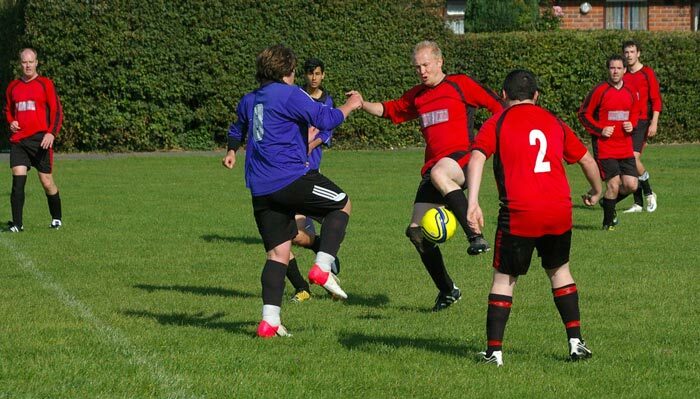 A fine cross from the left wing found Simon Cozens, who tried to lob the keeper who was rushing out to meet him. However, with the referee right on hand, the ball rebounded off the keeper and onto Simon. With howls of protestations from a couple of players, obviously unsighted, the ball fell nicely for Tom Fletcher to tap it into an empty net, thus opening his account for the team and giving them a lifeline back into the game; endorsed, as it seemed, by the sudden appearance of the sun. Immediately before half time both Andrew Murton and Tom Fletcher were unfortunate to miss great chances in front of the goal, credit to the T&Q keeper in saving the situation. The second half saw an entirely different game, between two apparently changed teams, one so much better and the other rather mediocre. NCC, the better, took centre, and instantly was on the offensive. They had a shot pass across the goal, with the keeper well beaten. In turn T&Q created a series of flowing movements, from which they won a corner and threatened their host’s goal. In the fiftieth minute NCC attacked up their left wing. From just inside his half Aaron Brown passed a well-directed ball to Andrew Murton, who sent a high lob-shot towards the goal. In plenty of space the keeper completely misread the situation, and found he had to collect the ball from the back of the goal. During the next ten minutes played flowed up and down the field, with both keepers making good saves. Although the T&Q keeper was the busier it was man of the match Karl Hemming who made the more dramatic save, when, on the hour, he pushed the ball onto the bar before it went behind for a corner. Clearing this corner NCC sped up the right wing, and gained a throw-on. The ball bobbled about before it reached Emlyn John, standing goal-side of the right-hand post. 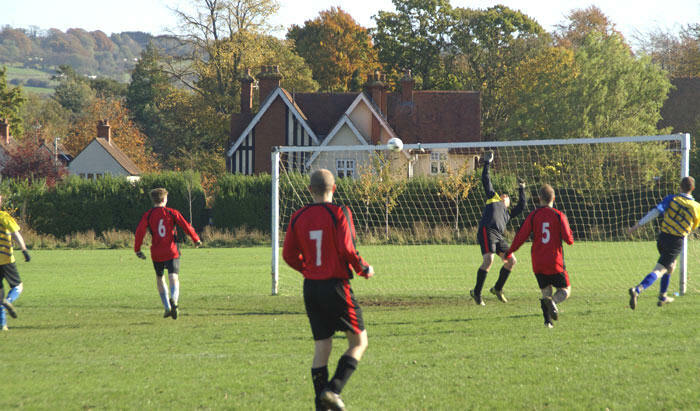 With great aplomb he sent a powerful header just beyond the reach of the keeper, who appeared to be rooted to the spot. With the score tied at three apiece, and half an hour still remaining, we had a great game shaping up, and everything to play for. In the next ten minutes both sides played hard; Jon Craxford fired a shot over the bar, Simon Trew made a determined clearance and the T&Q keeper notched up a hat-trick of saves. This was followed by a moment of confusion as the visitors had a throw on, from whence the ball flew beyond the outstretched hand of Karl Hemming, and so into the net; however, as the ball hadn’t touched anyone there was no score! The visitors had another chance but Karl made a great save as he pushed the ball across his goalmouth, before it was sent behind for a corner. From this an excellent through-ball was delivered up the left wing, to Andrew Murton, who took it beyond the T&Q defence. A well-struck lob sped over the outstretched arm of their keeper, jumping in his effort to halt the ball. Despite getting fingers to the ball its force enabled the goal to be scored, and remarkably NCC had taken the lead. For the remaining fifteen minutes of this pulsating game the spectators, especially the neutral ones, were provided with a dramatic thrill every five minutes, and many minor ones in between; there were still a couple of goals to come, one for each side. In the next five minutes T&Q saw the ball speed by the far post, with the home keeper beaten. Following dissention from the visitors, and another unsuccessful NCC attack, a lone T&Q forward charged down the left wing. As attendant players from each side rushed to the scene the number nine calmly selected his spot, and slid the ball past Karl Hemming; all square, an exciting thrill for the visitors. The next five-minute period was all NCC, as they controlled the midfield decisively, and were able to run up the wings with total freedom. This period ended with James Stevens taking a throw-on, from the right hand side. The ball came to Andrew Murton, well positioned in the goal area. The second thrill came as he was able to complete his hat-trick with a perfectly placed and most delicate header, reminiscent of the team’s third goal. Play continued, with NCC being the closer to another score when Simon Cozens latched onto a pass and ran towards the goal. With the keeper to beat, and a defender rushing up behind, his valiant effort was swept aside. Moments later NCC got their biggest thrill of the game as the final whistle was blown, and the team’s never give-up effort was rewarded with a remarkable, and thoroughly deserved win, in this nine-goal thriller.